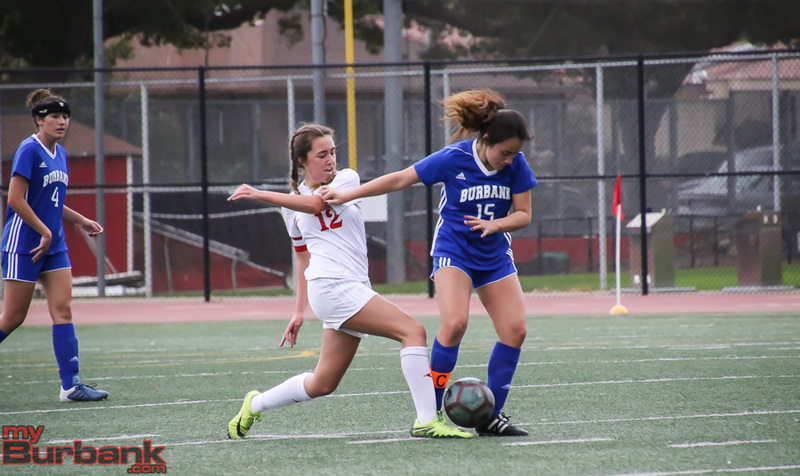 A junior, a sophomore and two freshmen accounted for all of the goals for the Burroughs High girls’ soccer team on Wednesday night at chilly and windy Memorial Field. 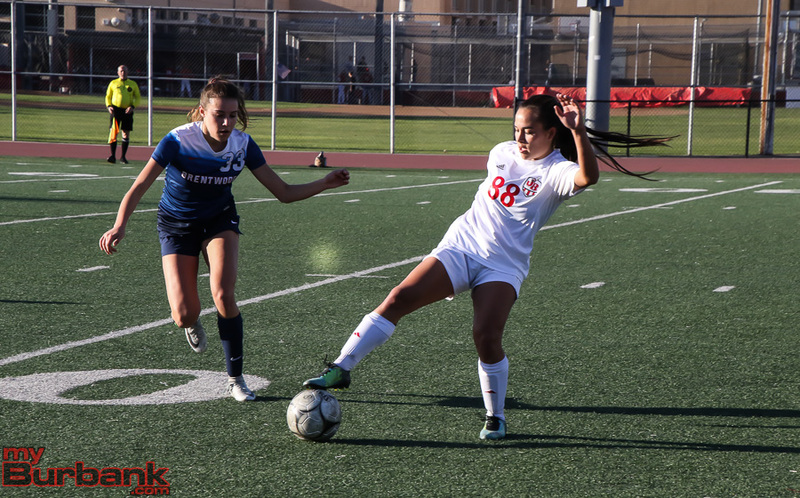 In short, the Indians were simply too fast, too good, too deep and too talented for Artesia in their CIF Southern Section Division IV first-round playoff match, winning 4-1. 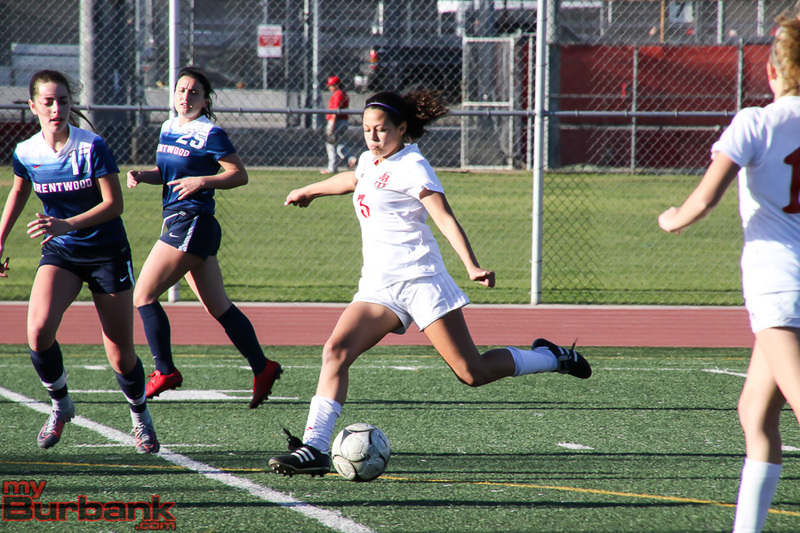 The Indians (16-3-2) will host Hemet (20-2-5), which held off visiting Estancia 2-1 in an opening-round contest, on Friday with a likely 5 p.m. start time. Freshman defender Samantha Valencia started off the scoring with a 32-yard free kick in the sixth minute for a 1-0 lead. In the 28th minute, junior midfielder Olivia Cashman’s 15-yarder extended the Indians’ advantage to 2-0. “I had a lot of pressure and I was trying to blast it, but I didn’t get much of a foot on it, but it went in,” said Cashman of her goal. Cashman knows that the defense is critical, especially in the postseason. “We have such a strong defense. 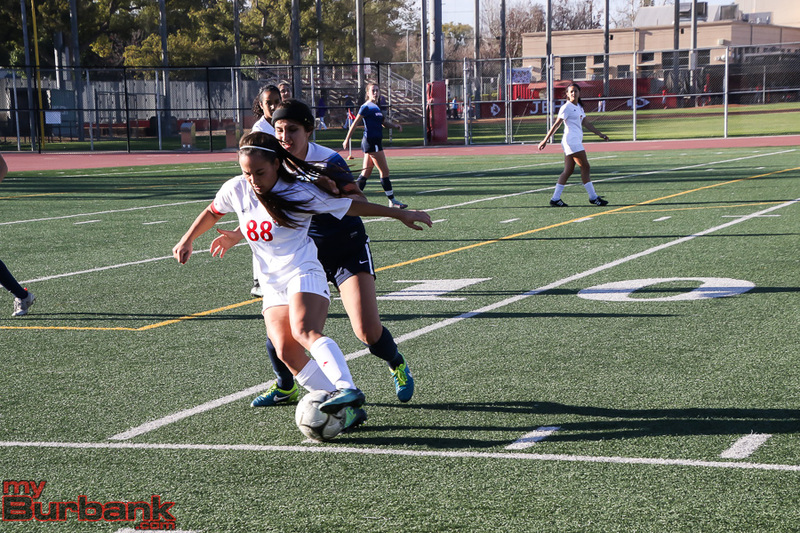 Especially when we played Arcadia and CV during league, we had to make sure we had a strong defense,” she said. The Indians placed first in the Pacific League, something they haven’t done since 1993 when they were in the Foothill League. The lead ballooned to 3-0 in the 51st minute when freshman forward Megan Schmidt made a nice juke move 15 yards from the goal which brought out sophomore goalie Jizelle Velasquez. Schmidt then tapped in a five-yarder for a 3-0 edge. 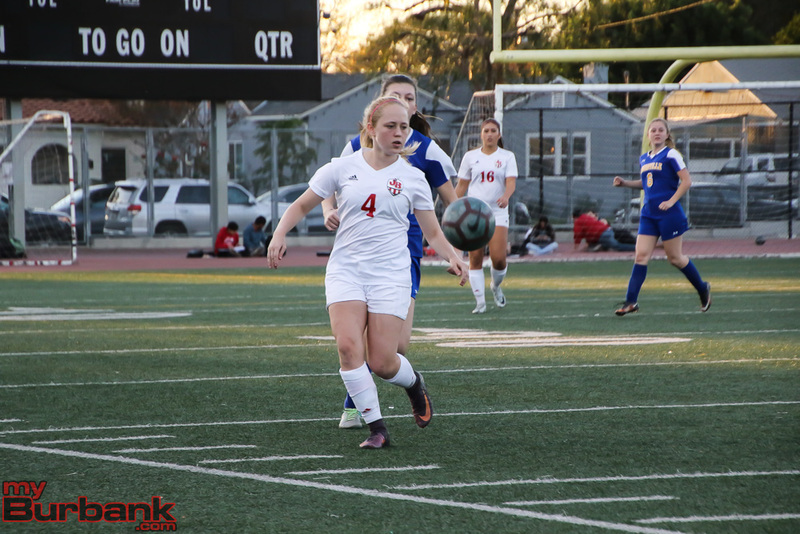 In the 55th minute, senior midfielder Abbie Riggs slammed a 45-yard free kick into the box which sophomore forward Lauryn Bailey retrieved, found room to navigate around players and then crushed a 20-yarder into the back of the net for a 4-0 cushion. 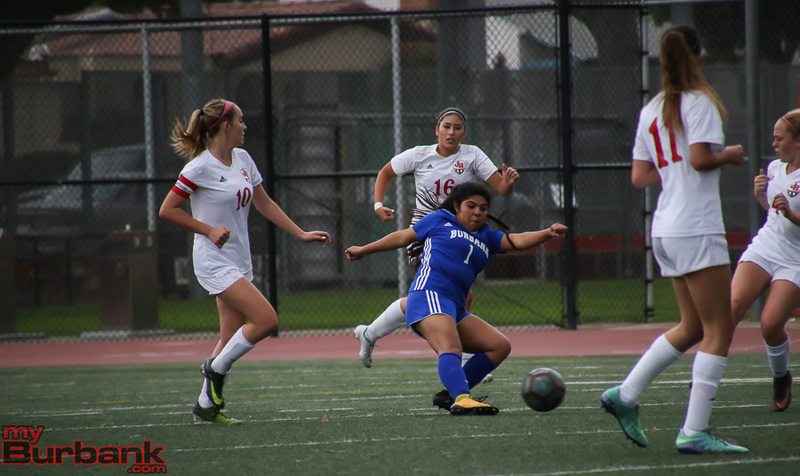 The Pioneers (12-6-5) avoided the shutout when senior Michelle Abarca knocked in a 15-yarder in the 57th minute past freshman goalie Kaylin Casper, who was otherwise perfect. 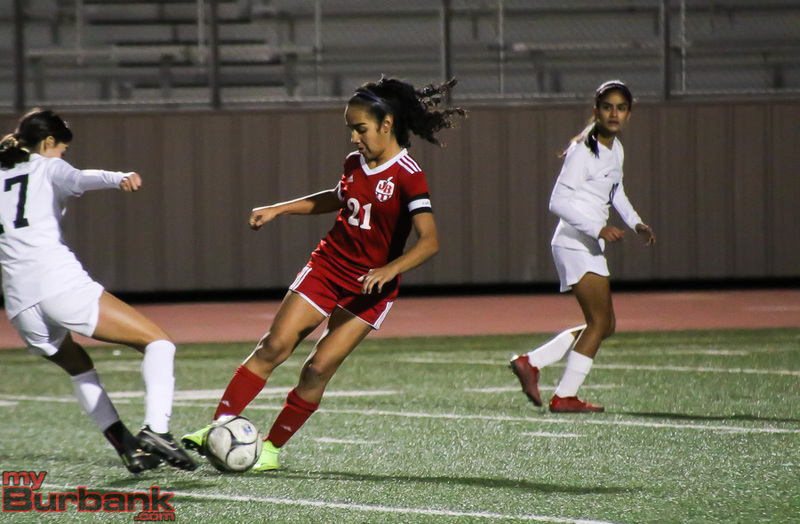 Valencia’s 35-yard kick sailed wide right in the third minute, sophomore defender Jessie Virtue had a 15-yarder in the 11th minute for the Indians, and Valencia tacked on a 25-yarder in the 17th minute. 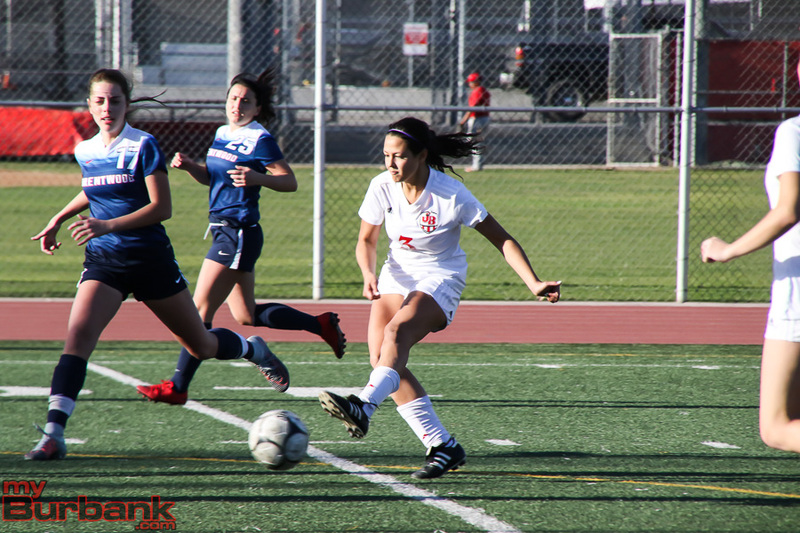 Junior Abigail Sanchez delivered a 30-yarder in the 19th minute for Artesia, followed by Bailey’s 20-yarder in the 22nd minute. 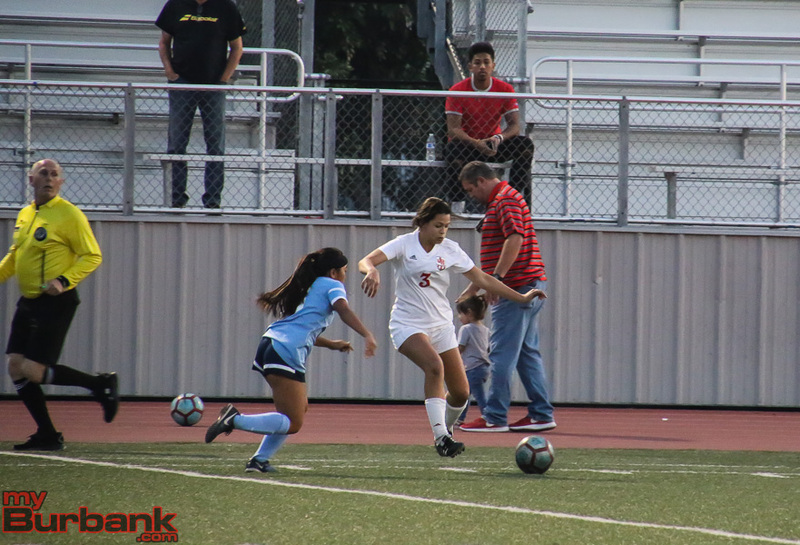 Sophomore midfielder Lily Gonzalez, who turned her right ankle in the opening half which required an ice pack, had a 15-yarder in the 30th minute that hit the left goal post. Riggs then added a 46-yard free kick in the 32nd minute. As of Wednesday night, it’s not certain whether Gonzalez will be able to play against Hemet on Friday. 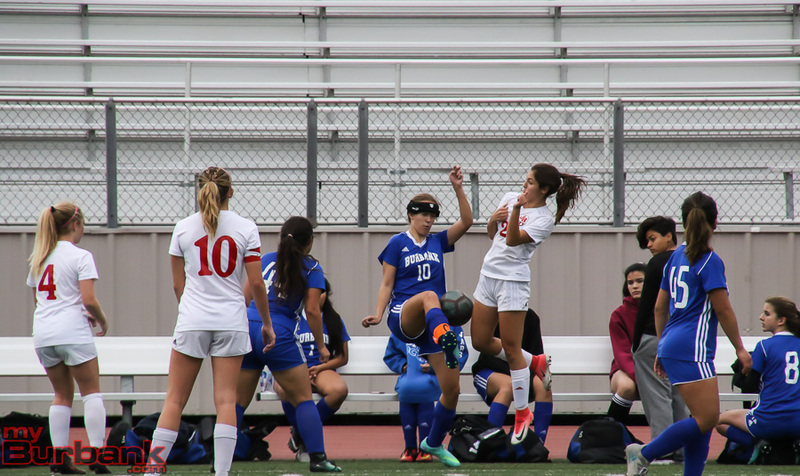 Sophomore Stephanie Flores had a 35-yard free kick in the 35th minute for the Pioneers and teammate senior Celeste Rodriguez tossed in a 20-yard header in the 36th minute. Bailey’s 20-yard attempt was scooped up by Velasquez in the 38th minute. Cashman had a 35-yarder in the 39th minute while Bailey’s 25-yarder caromed off the cross bar in extra time. 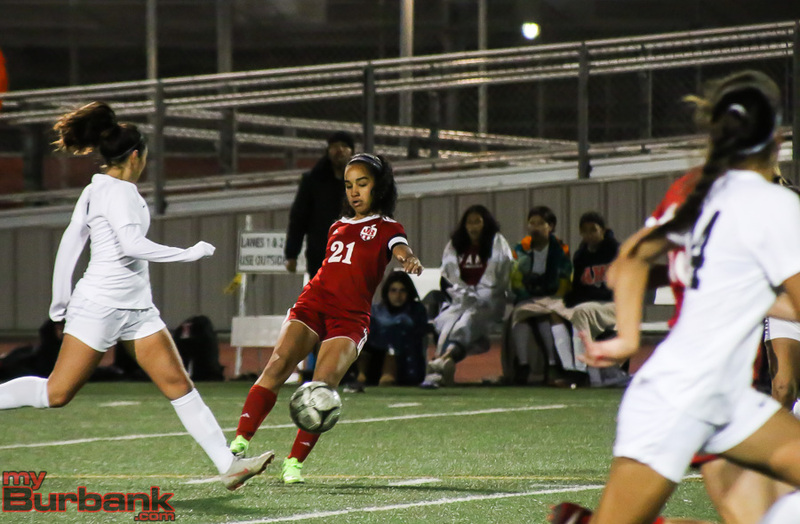 Abarca contributed a 35-yarder in the 42nd minute, Burroughs junior forward Trinity Vournas countered with a 25-yarder in the 46th minute and Rodriguez answered from 30 yards in the 60th minute. Bailey had back-to-back attempts and included a 15-yarder in the 61st minute and a 25-yarder in the 64th minute that soared too high. 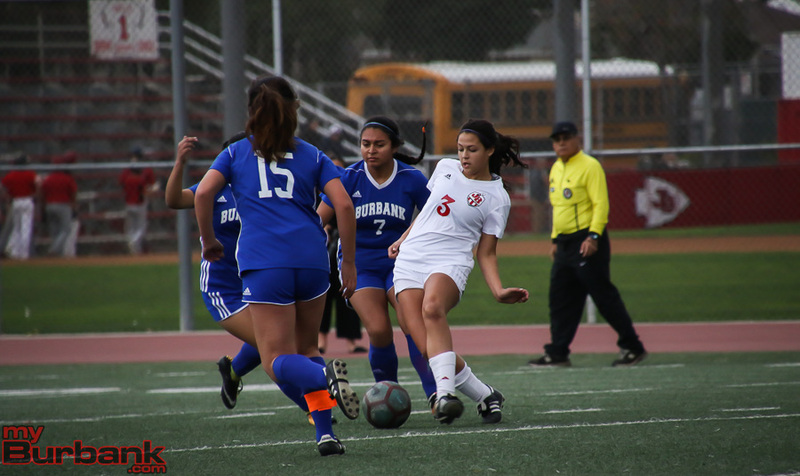 Cashman’s 35-yarder in the 65th minute was off target, Flores added a 25-yarder in the 72nd minute that drifted wide left for the Pioneers and teammate, junior Kimberly Flores had a 25-yarder in the 75th minute. 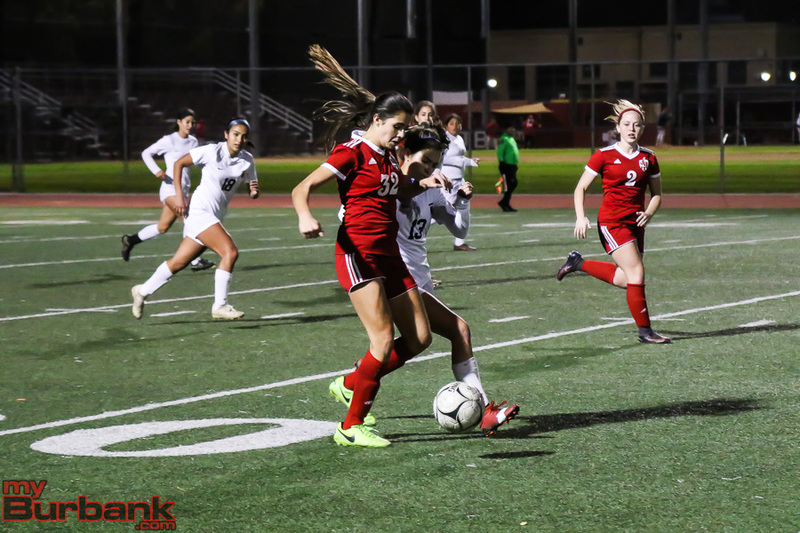 This entry was posted in Girls Soccer, Sports and tagged Abbie Riggs, Burroughs High, CIF first-round playoffs, Girls Soccer, Jessie Virtue, Kaylin Casper, Lauryn Bailey, Lily Gonzalez, Megan Schmidt, Olivia Cashman, Samantha Valencia, Trinity Vournas on February 7, 2019 by Rick Assad. 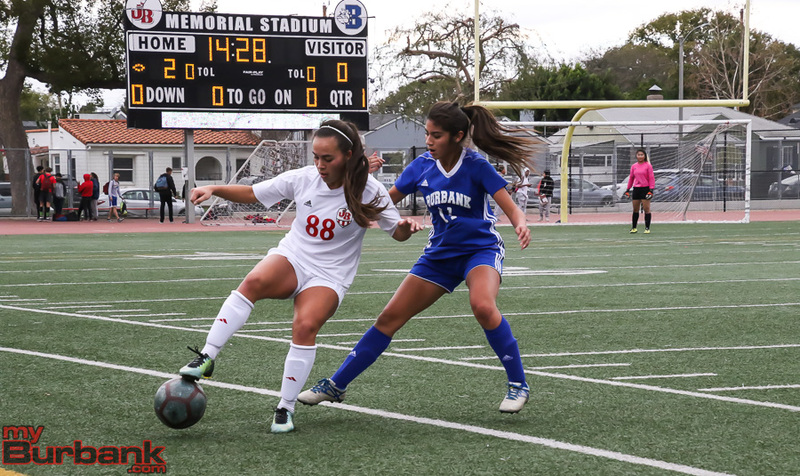 It’s not official just yet, but the Burroughs High girls’ soccer team, which held on for a 2-1 victory over longtime powerhouse Arcadia at Memorial Field on Tuesday afternoon, is one game away from winning its first league title in more than a quarter century. The last time the Indians (14-3-2 and 11-1-1 in league) won a league banner was during the 1992-1993 season when they were members of the Foothill League. 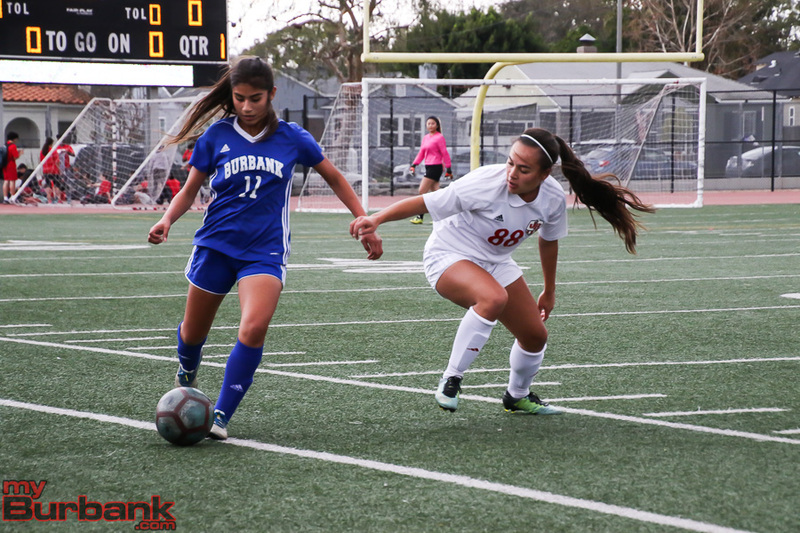 On Thursday, with a victory over city rival Burbank, the Indians could capture at least a share of the Pacific League title. 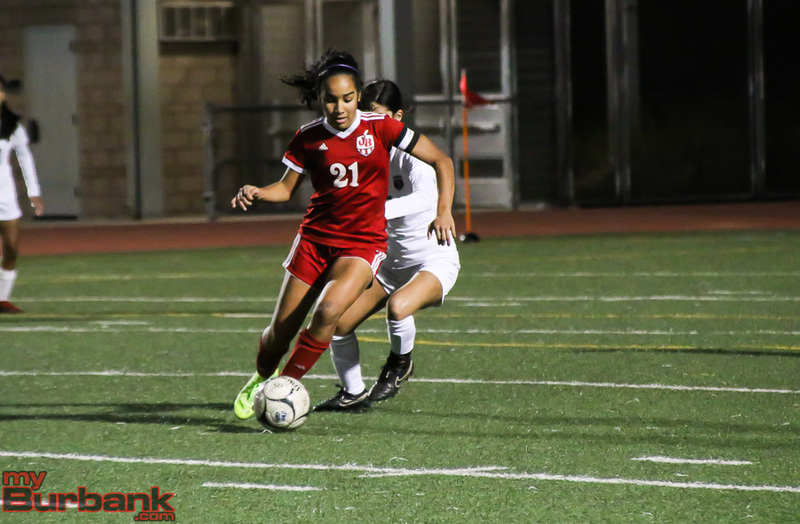 Burroughs could win the league crown outright if Crescenta Valley (14-4-3 and 11-1-1 in league) losses or ties against Arcadia (10-8-2 and 9-3-1 in league). 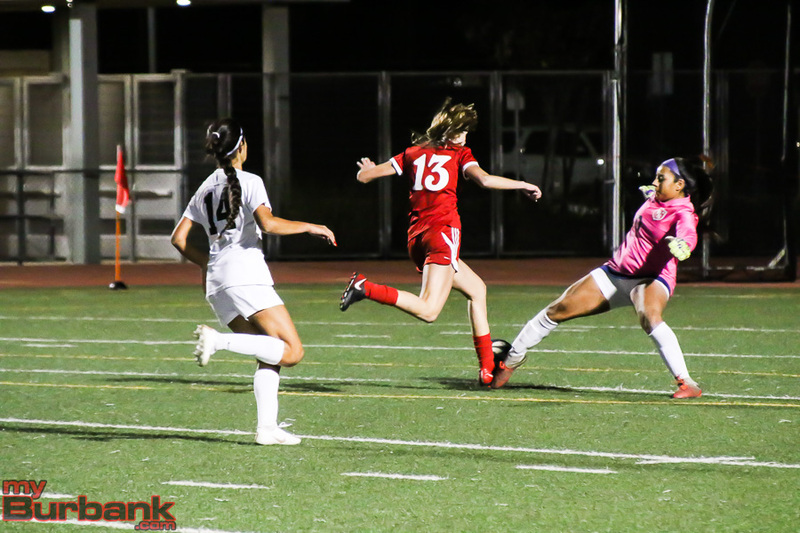 A goal in each half by Burroughs against the powerful Apaches set up a celebration afterward. In the 29th minute, and on 25-yard blast off the right foot of Lauryn Bailey, the match was even at 1-1. 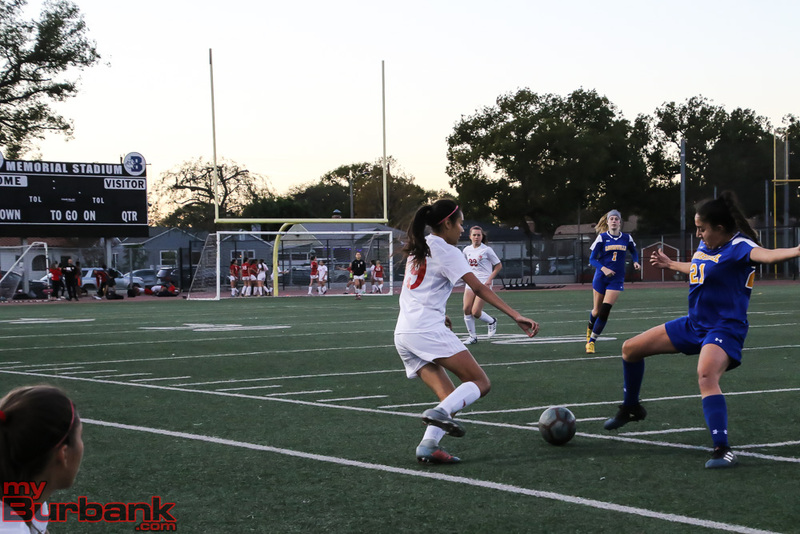 The clincher was kicked into the net from 15 yards in the 65th minute and came from sophomore midfielder Lily Gonzalez, who was given a yellow card in the 61st minute. “When I came off I was very frustrated with myself, the way I was playing, but I knew that my performance shouldn’t go against my teammates, so I knew that when I go back in, I had to play twice as hard,” Gonzalez said. 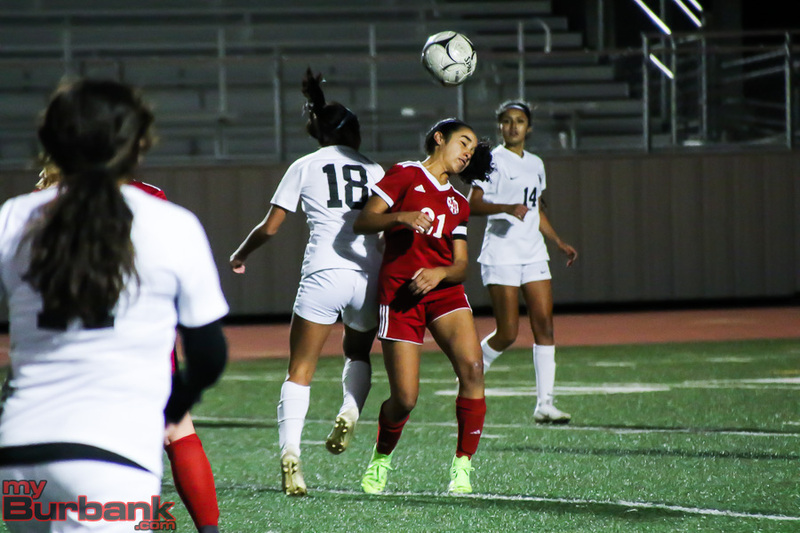 The Apaches bounded ahead 1-0 when junior forward Bertha Guzman drilled a 15-yarder from the right side in the 12th minute that eluded freshman goalie Kaylin Casper. 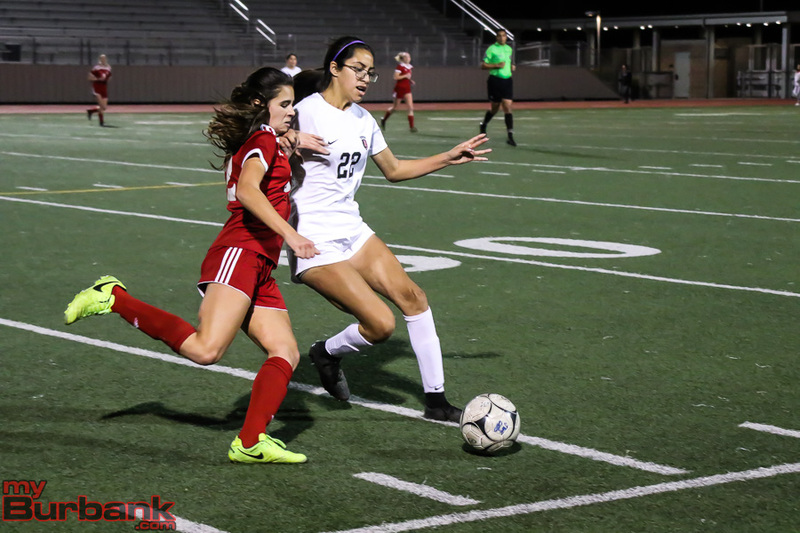 Samantha Valencia (#16) and Abbie Riggs (#10) battle for the ball. (Photo by Ross A. Benson). Emily McHorney was an important cog in the victory. 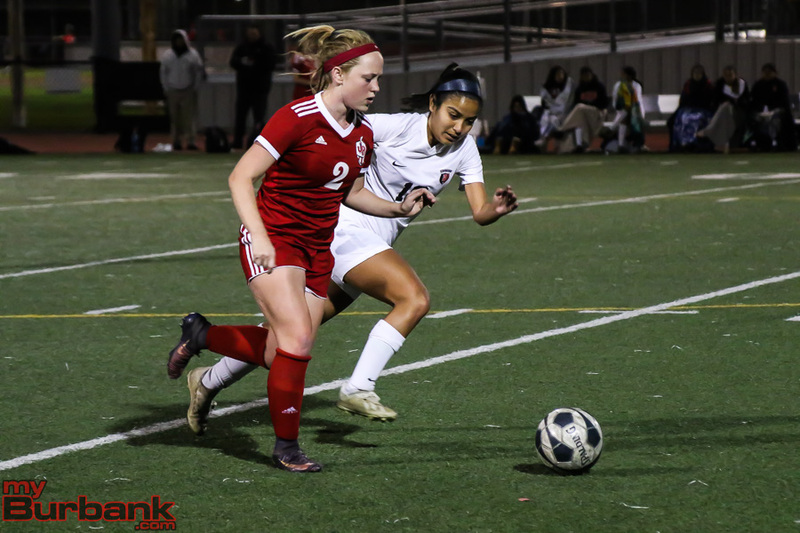 “She played the best game of her career and it’s been a damn good career,” Riggs said of the senior defender, who along with junior Ava Kramer are defensive stalwarts. 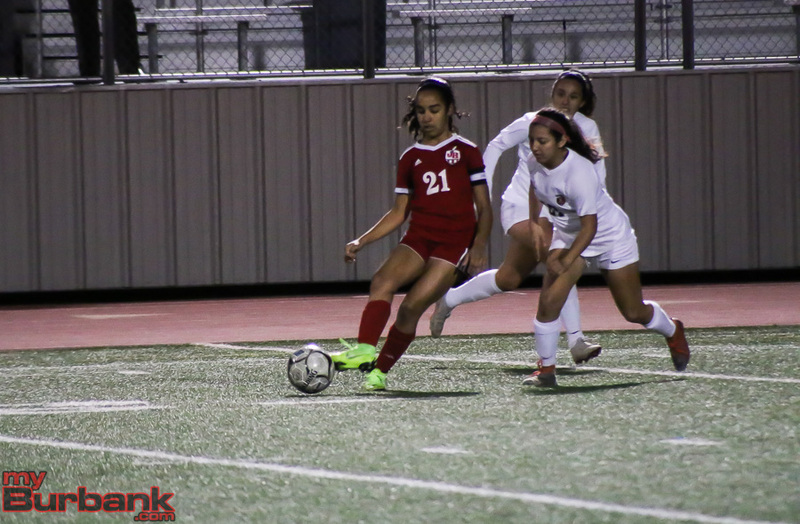 After Arcadia’s lead, the Indians dominated the action until Guzman unloaded a shot in the 27th minute. Bailey had a kick in the 13th minute and one in the 14th minute that sailed too high over the net. 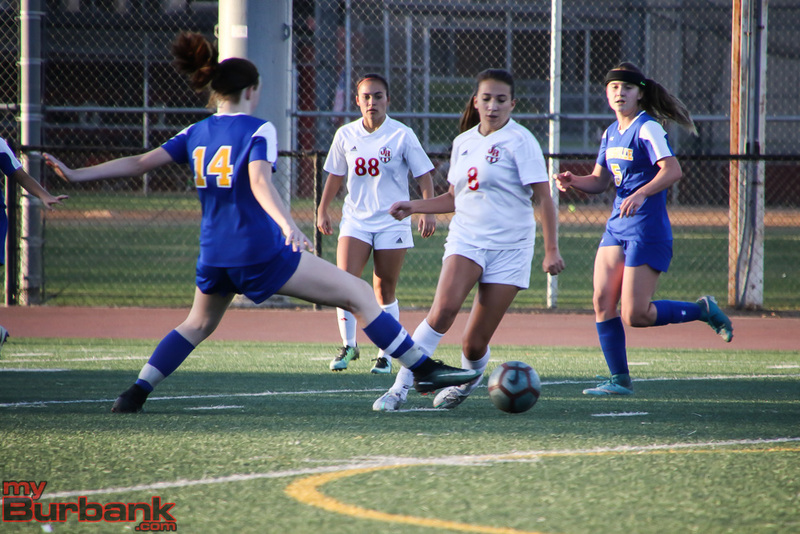 Gonzalez’s kick in the 15th minute drifted wide right and a 10-yard attempt in the 17th minute by junior forward Trinity Vournas was blocked, while junior midfielder Olivia Cashman added a kick in the 19th minute from 20 yards. 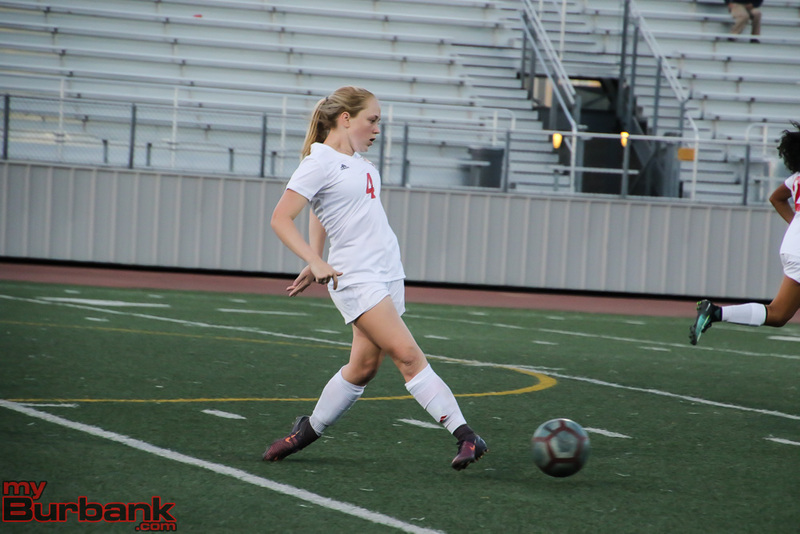 Senior midfielder Abbie Riggs contributed a 33-yard free kick in the 21st minute for the Indians. Riggs knows the importance of defense. Two kicks by Bailey followed and included a 35-yarder in the 33rd minute and a 25-yarder in extra time. Junior defender Teresa Gardner had a 35-yarder in the 41st minute for the Apaches. 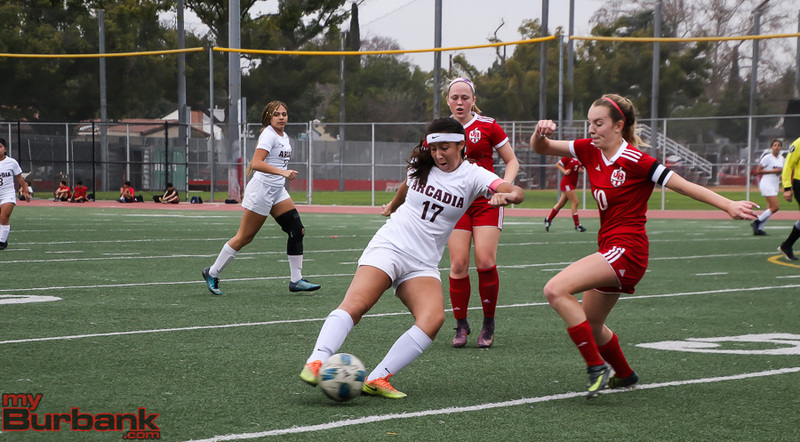 Freshman Samantha Valencia delivered a 35-yard kick in the 46th minute that was scooped up by Arcadia senior goalie Katherine Guerra. Vournas had a close-range header in the 48th minute and Gonzalez’s 20-yarder sailed wide left in the 49th minute. Valencia had a free kick in the 51st minute and a corner kick by Riggs and Bailey’s follow-up kick in the 54th minute missed the mark. Gardner’s free kick in the 56th minute was too high and Cashman’s attempt in the 59th minute drifted wide right. 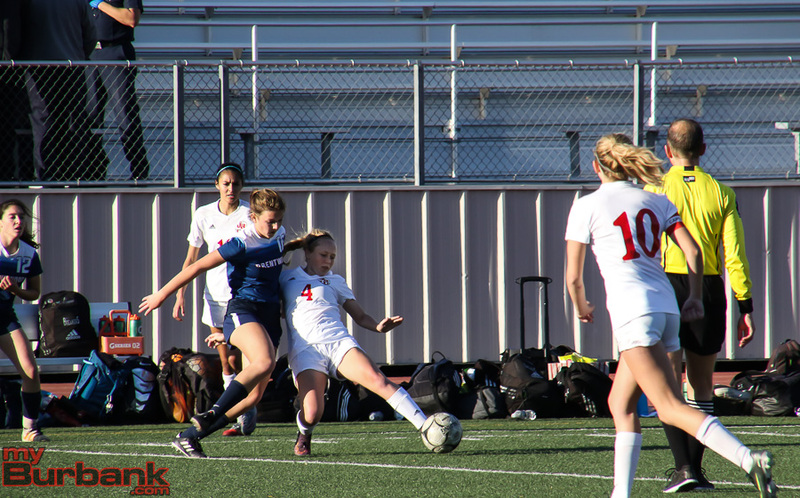 Freshman midfielder Avery Bogue’s 30-yarder in the 60th minute was off target for the Apaches. 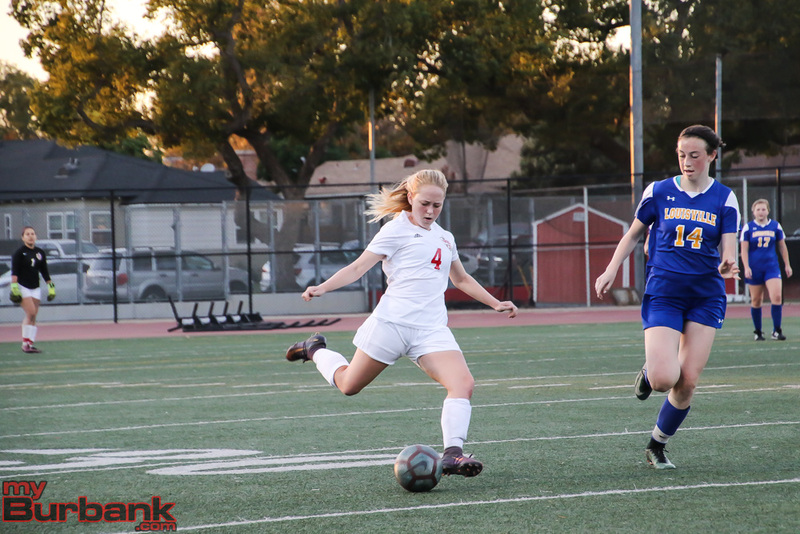 Burroughs freshman forward Megan Schmidt delivered three straight kicks and they included a 35-yarder in the 61st minute, an attempt in the 62nd minute and a 20-yarder in the 63rd minute. Cashman contributed a 20-yarder in the 63rd minute and Riggs tacked on a kick in the 64th minute. 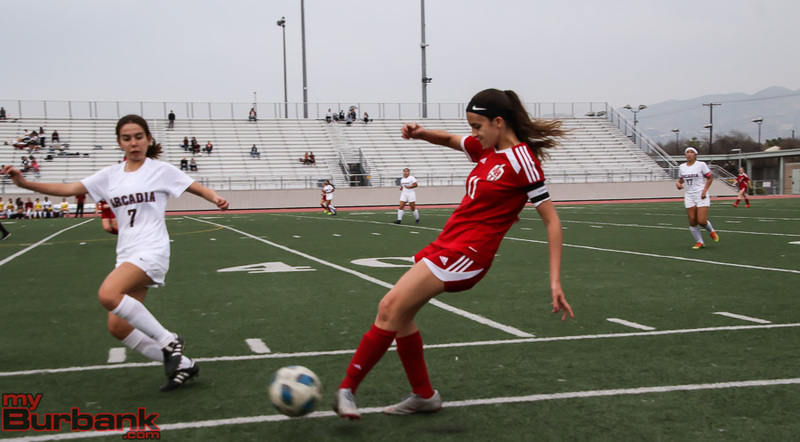 This entry was posted in Girls Soccer, Sports and tagged Abbie Riggs, Ava Kramer, Burroughs High, Emily McHorney, Girls Soccer, Kaylin Casper, Lauryn Bailey, Lily Gonzalez, Megan Schmidt, Olivia Cashman, Pacific League, Samantha Valencia, Trinity Vournas on January 30, 2019 by Rick Assad. 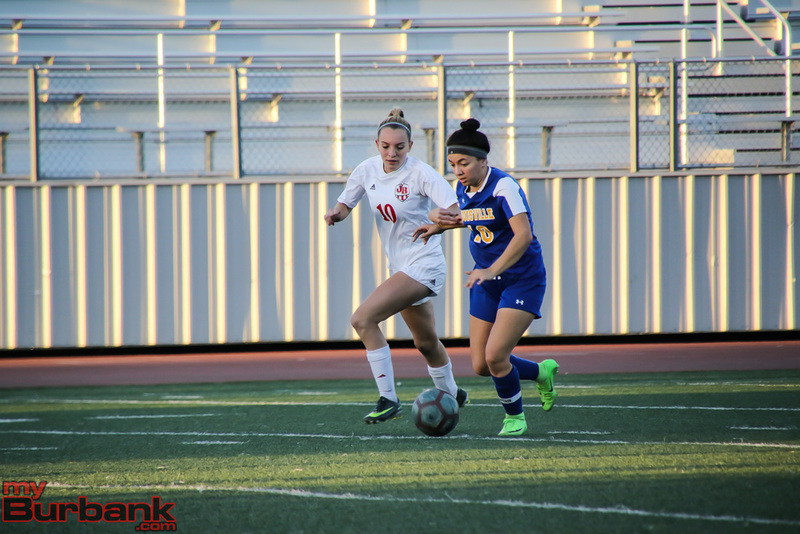 Burroughs High’s Abbie Riggs is an extremely well-rounded soccer player with a multitude of talents. One could argue that Riggs’ best asset is her ability to put the ball into the back of the net on free kicks. 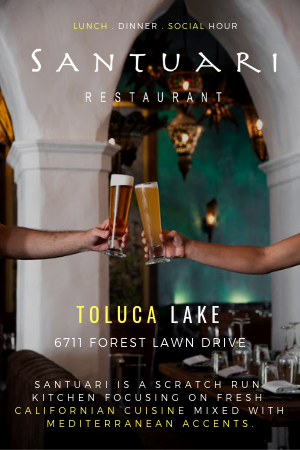 On Tuesday at Crescenta Valley, the senior midfielder blasted a 21-yarder in the 79th minute that deflected off a Falcon player as the Indians rallied for a 2-2 tie in a Pacific League match. In the 76th minutes, Riggs let loose with a 20-yard free kick that didn’t find the back of the net. 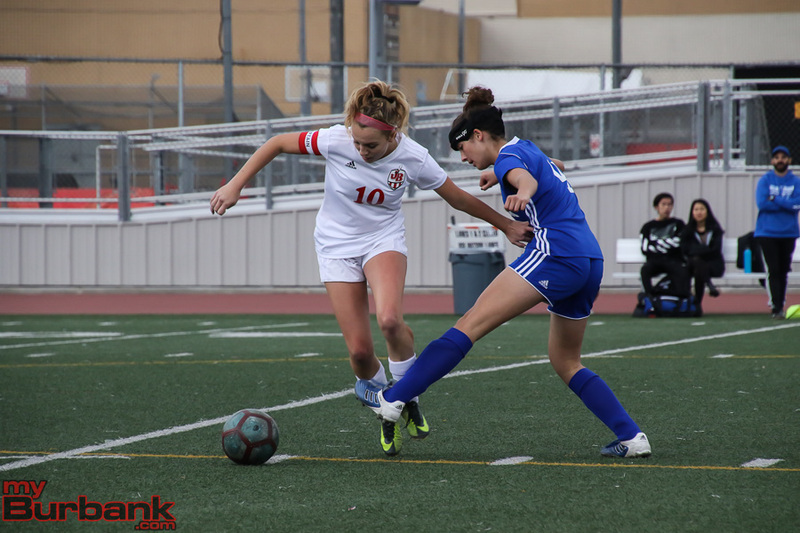 It was tied 1-1 at the intermission when Burroughs sophomore forward Lauryn Bailey spotted junior forward Trinity Vournas, who then kicked the ball into the net in the 10th minute. 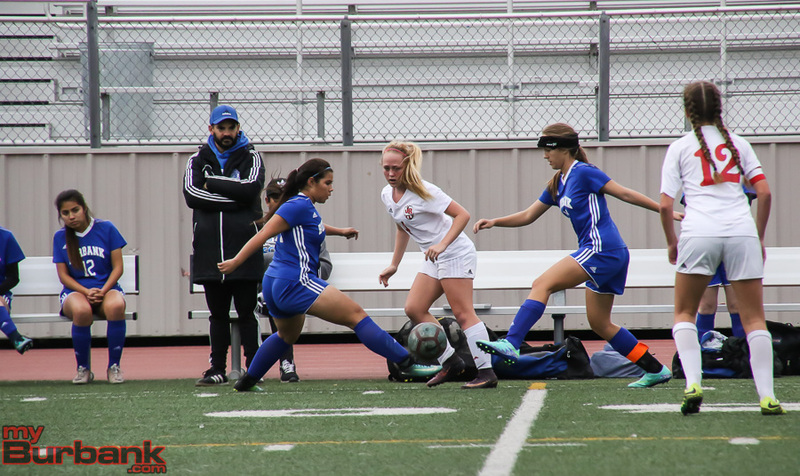 The Falcons (3-1-3 and 2-0-1 in league) darted in front 2-1 on a goal from sophomore Julianna Cheney in the 63rd minute on a beautiful juke move. The Falcons jumped out to a 1-0 advantage in the fifth minute when junior Kathryn Thamasian knocked home a penalty kick from 20 yards after a hand ball infraction. In the second minute, Riggs had a kick stuffed and in the sixth minute Bailey’s 20-yarder failed to find the mark. 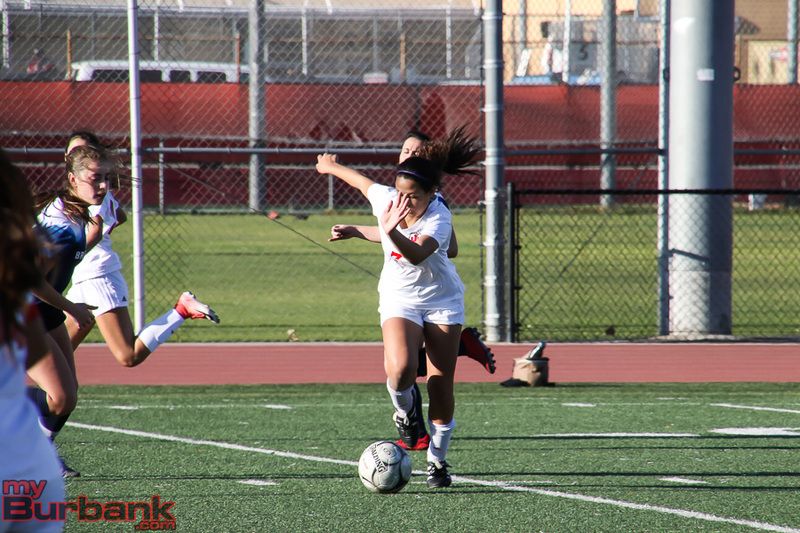 Burroughs freshman defender Samantha Valencia’s 35-yarder in the eighth minute was off the mark. In the ninth minute, Riggs’ 35-yarder sailed wide left. Valencia’s dribbler from 25 yards in the 19th minute didn’t find the goal. Crescenta Valley freshman Rachel Park had a 20-yarder in the 25th minute. Thamasian would have scored in the 28th minute, but sophomore Dana Ryan was offside. Junior midfielder Olivia Cashman unloaded a 25-yarder in the 34th minute for the Indians (2-2-2 and 2-0-1 in league). 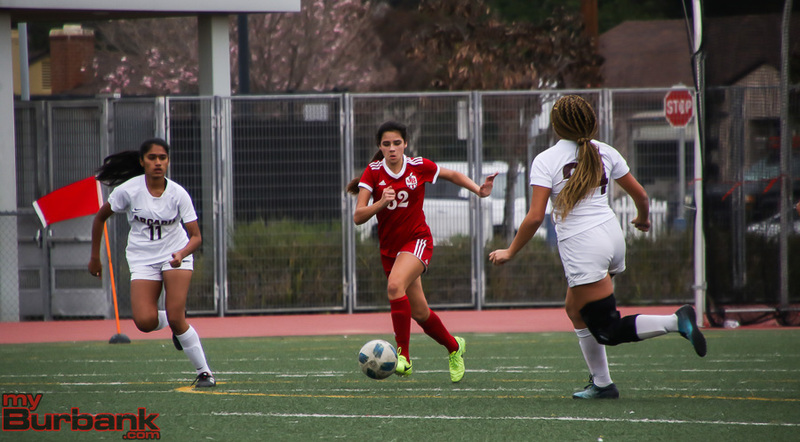 Sophomore midfielder Lily Gonzalez walloped a 20-yareder in the 48th minute for Burroughs and Gonzalez added a 20-yarder in the 49th minute. In the 44th minute, Cashman had a 20-yarder while Falcon sophomore Chloe Ayala almost scored on a 10-yarder in the 61st minute. Ryan delivered a 15-yarder in the 65th minute and Gonzalez unleashed a 15-yarder in the 73th minute. 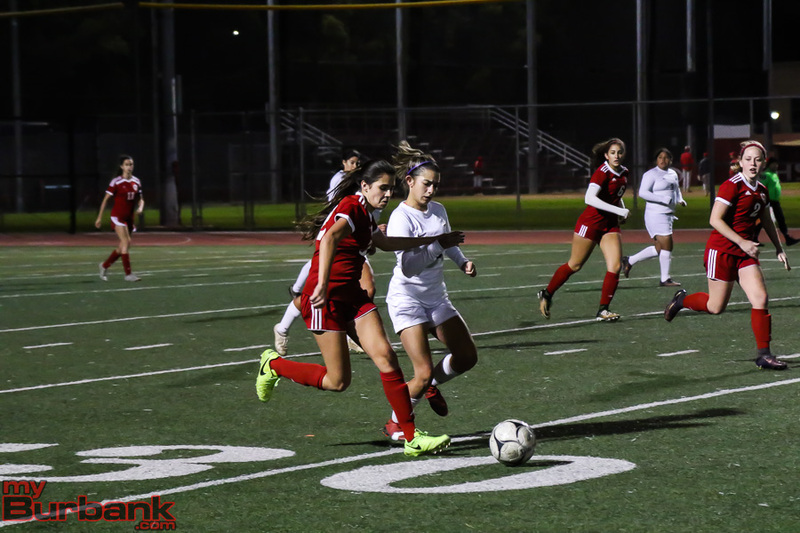 This entry was posted in Girls Soccer, Sports and tagged Abbie Riggs, Burroughs High, Girls Soccer, Lauryn Bailey, Lily Gonzalez, Olivia Cashman, Pacific League, Samantha Valencia, Trinity Vournas on December 12, 2018 by Rick Assad. 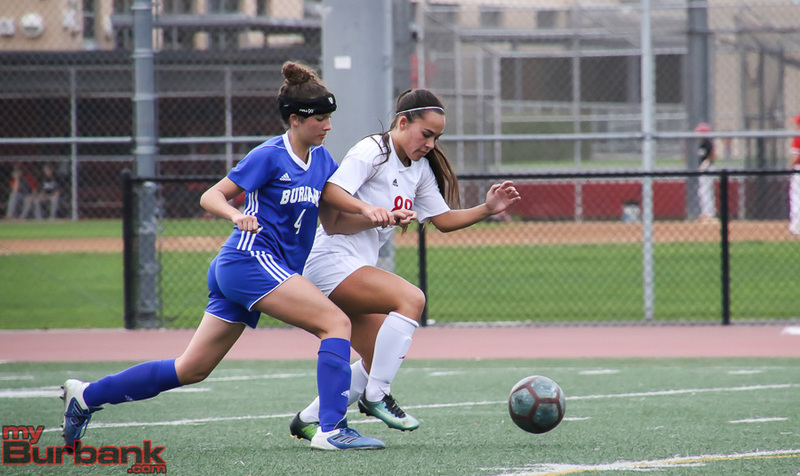 A single goal early on was the difference in Tuesday’s CIF Southern Section Division IV wild-card playoff match between the Burroughs High girls’ soccer team and Brentwood at Memorial Field. The only tally came in the third minute and was knocked into the back of the net by junior defender Emily McHorney on an assist by freshman forward Lauryn Bailey. Just prior to McHorney’s 15-yard blast that made it 1-0, sophomore midfielder Olivia Cashman’s 35-yarder caromed off the crossbar. 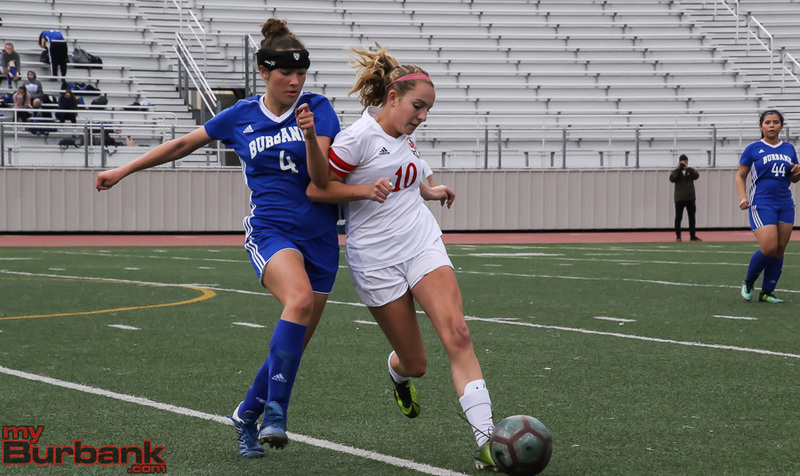 Burroughs, which placed second in the Pacific League and also won its first playoff match since 2009, will travel three hours to Santa Ynez (16-1-1) for a 3 p.m. first-round clash on Thursday. 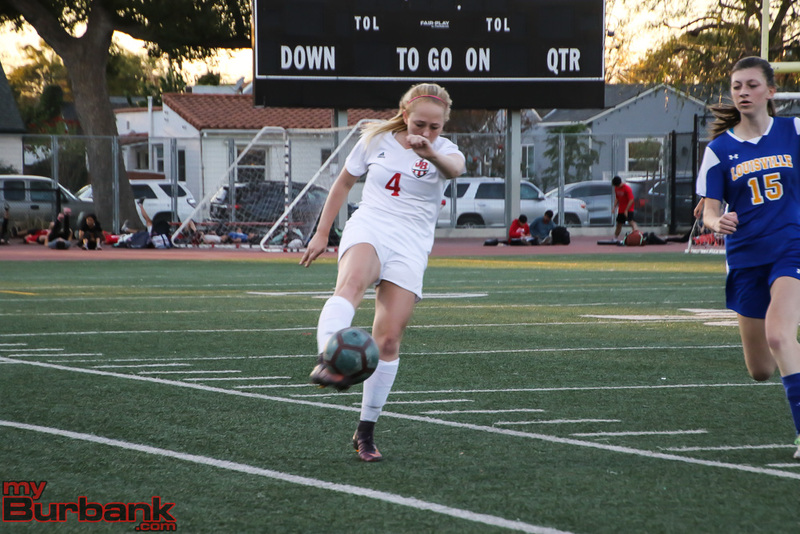 In the fifth minute, senior defender Gabby Soofer had a 41-yard free kick for the Eagles (9-6-5 and fourth place in the Gold Coast League). 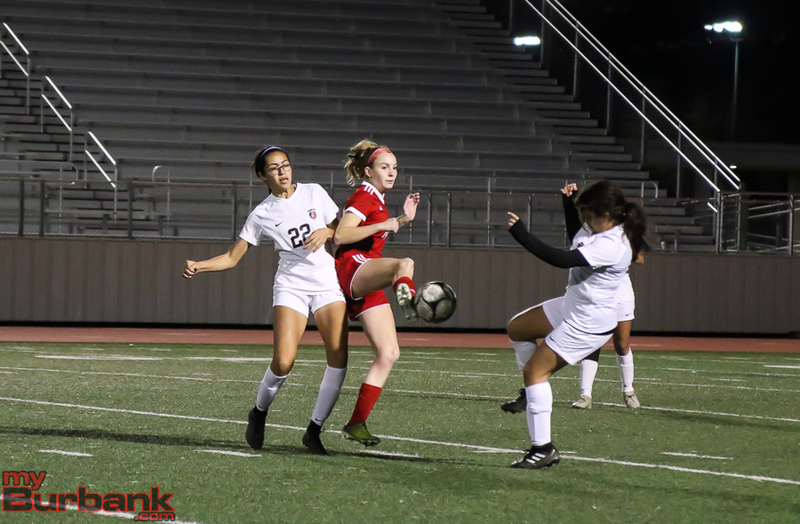 But the Indians had the next three boots that included a 40-yard free kick from senior defender Anna Kasper in the sixth minute, senior forward Catrina Villalpando’s 30-yarder in the sixth minute and senior defender Natalie Celio’s 30-yarder in the eighth minute. 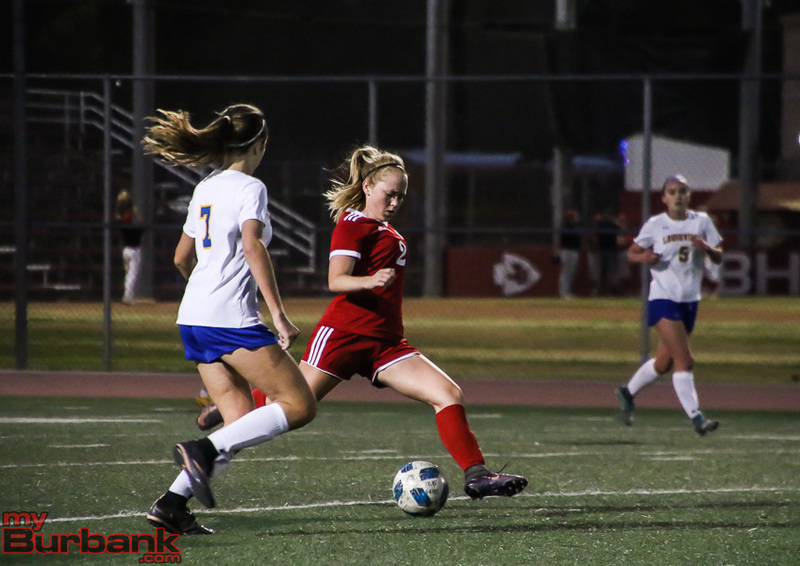 Brentwood junior forward Kelly Tipton had a 20-yarder in the ninth minute, only to see Burroughs (15-2-3) rattle off seven kicks that included Cashman’s 30-yarder in the 11th minute, Cashman’s 35-yarder in the 13th minute, sophomore forward Trinity Vournas’ 25-yarder that sailed wide left in the 16th minute and senior midfielder Maddy Sena’s 40-yarder in the 20th minute. The other kicks were junior midfielder Abbie Riggs’ 35-yard laser three minutes later, sophomore defender Orla Giffen’s 35-yarder that scooted wide right in the 24th minute and sophomore defender Ava Kramer’s 25-yard blast in the 26th minute. Sophomore midfielder Ava Deconcini broke the streak with a 25-yarder in the 29th minute for the Eagles. But Bailey had a 25-yard bullet in the 31st minute and Villalpando’s rebound in the same minute hit the crossbar. 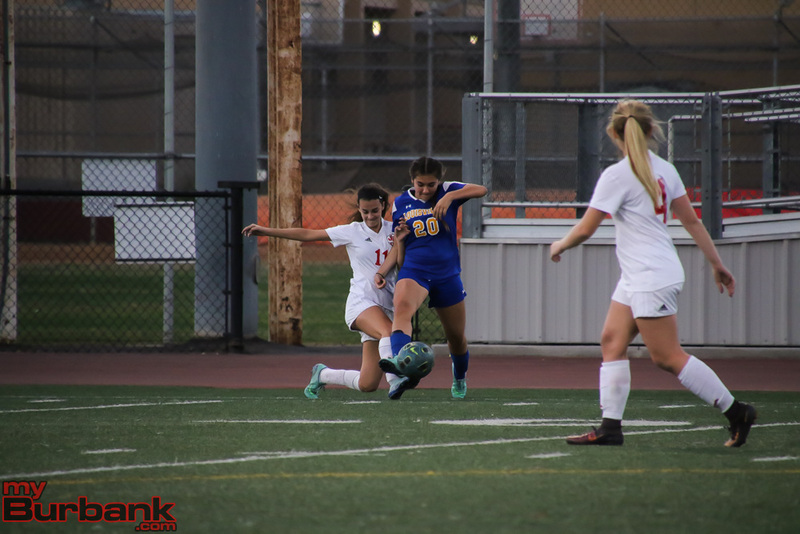 Junior defender Clair Altman delivered a corner kick for Brentwood in the 35th minute followed by freshman and teammate, midfielder Sadie Sarkisian’s 15-yarder. Kramer then added a 35-yarder that was too high in the 36th minute and Giffen tossed in a 30-yarder a minute later. Soofer’s 41-yard free kick in extra time was the last attempt in the opening half. The Indians then began the second half by collecting four straight kicks and they included Riggs’ 35-yard free kick in the 45th minute, Bailey’s 21-yard free kick a few minutes later, Riggs’ 15-yarder that nailed the upright in the 49th minute and Riggs’ 20-yarder that drifted wide left two minutes later. Soofer chimed in with a free kick that was headed by Deconcini in the 54th minute. Deconcini had a 35-yarder in the 58th minute and then added a 15-yarder in the 65th minute. Senior forward Issy Levi tossed in a header that struck the crossbar in the 66th minute for Brentwood. Kasper’s 34-yard free kick in the 71st minute was off target and Giffen’s 20-yarder was wide left two minutes later. 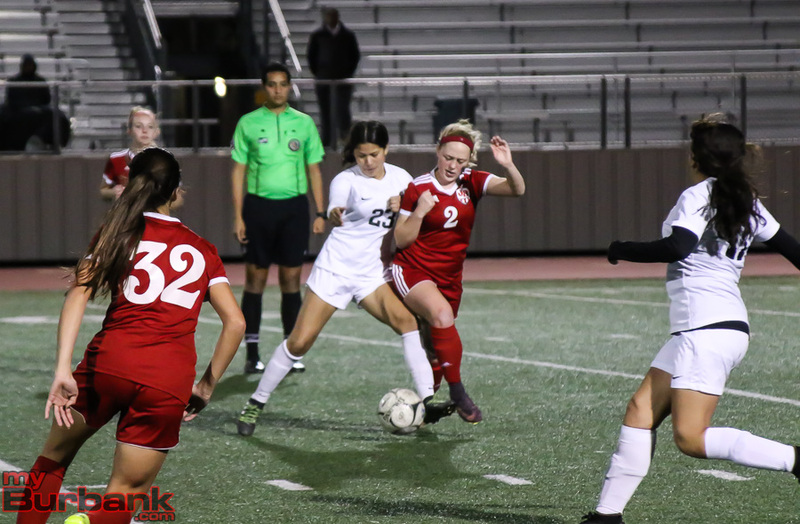 Soofer’s 45-yard free kick was off target in the 74th minute, Villalpando’s 20-yarder missed in the 76th minute, and Soofer’s 38-yard free kick in extra time ended the fray. 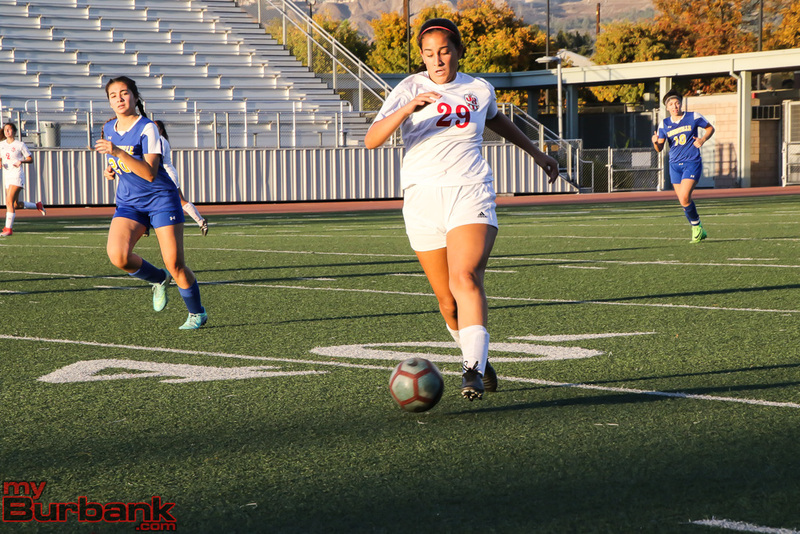 Burroughs senior goal keeper Samantha Martinez was seemingly nothing less than brilliant, especially in the second half when the setting sun was directly in her face. 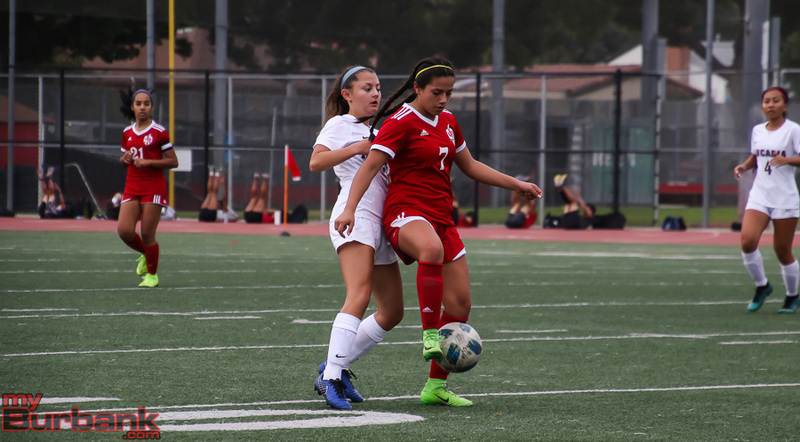 This entry was posted in Girls Soccer, Sports and tagged Abbie Riggs, Anna Kasper, Ava Kramer, Burroughs High, Catrina Villalpando, CIF Southern Section playoffs, Emily McHorney, Girls Soccer, Lauryn Bailey, Maddy Sena, Natalie Celio, Olivia Cashman, Samantha Martinez, Trinity Vournas on February 14, 2018 by Rick Assad. 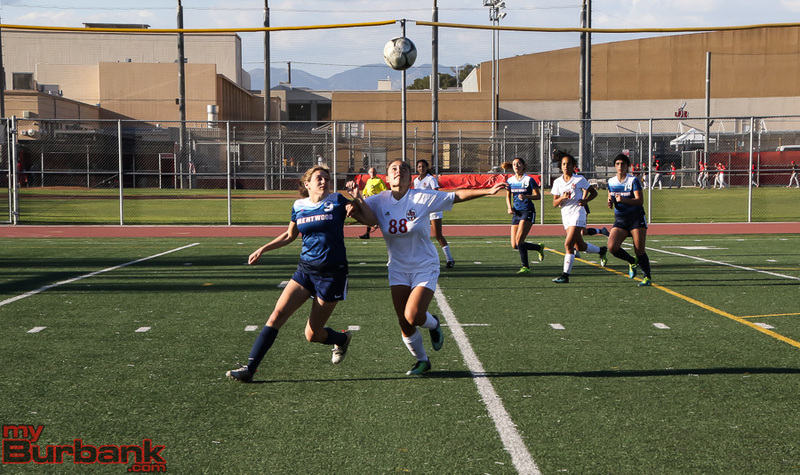 A year ago the Burbank and Burroughs girls’ soccer programs were relatively on par with one another. 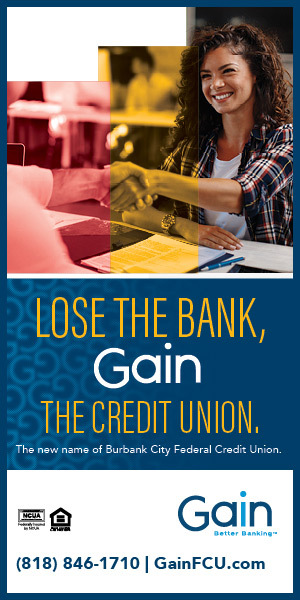 Things have changed greatly in a year. 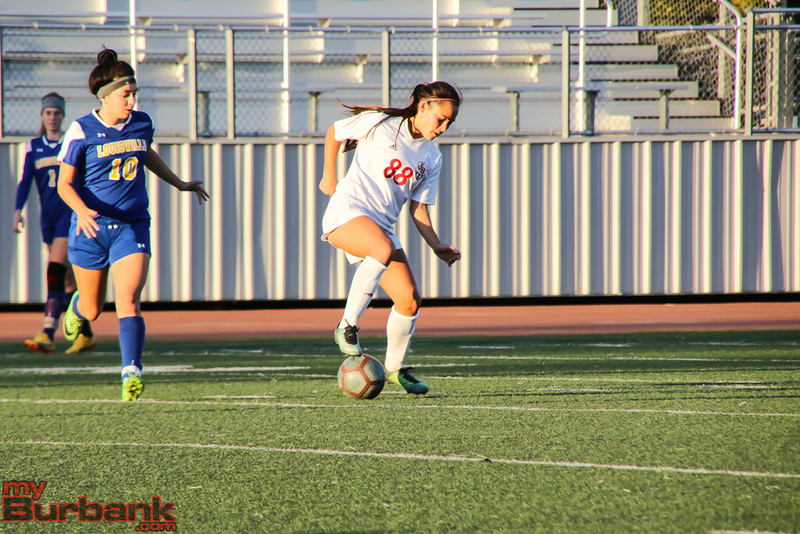 Friday afternoon Burroughs dominated the Bulldogs 4-0 in a Pacific League match at Memorial Field. 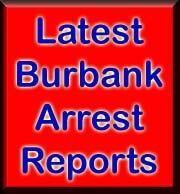 Burroughs had 24 shot attempts. Burbank did not have any shot attempts. 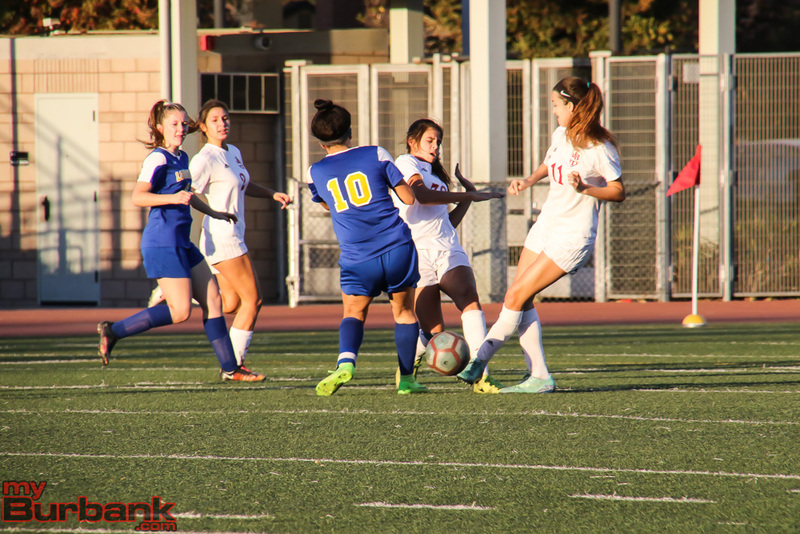 Burroughs (10-2-2 overall, 5-1-1 in the league) scored three times in the first half. Freshman Lauryn Bailey got things started in the seventh minute by scoring on an assist from Abbie Riggs. 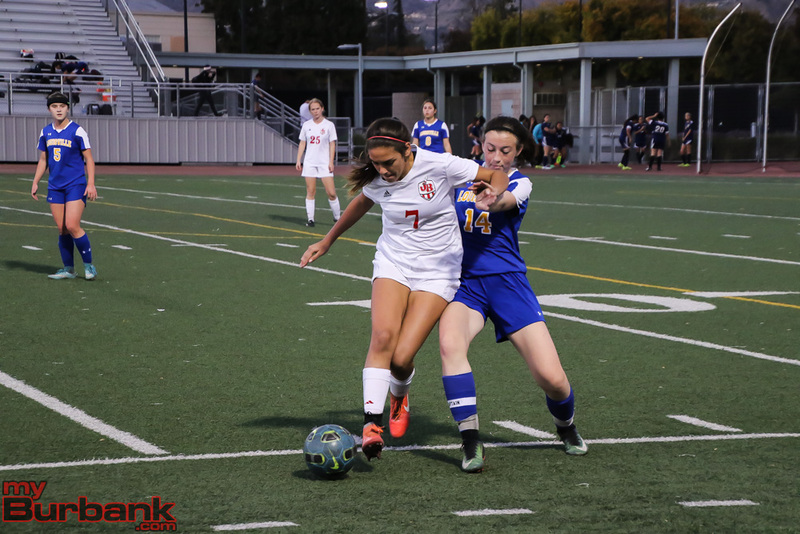 Burroughs doubled its lead in the 14th minute when Bailey scored on an assist from Trinity Vournas. Catrina Villalpando pushed the lead to three goals in the 27th minute thanks to an assist from Trinity Vournas. 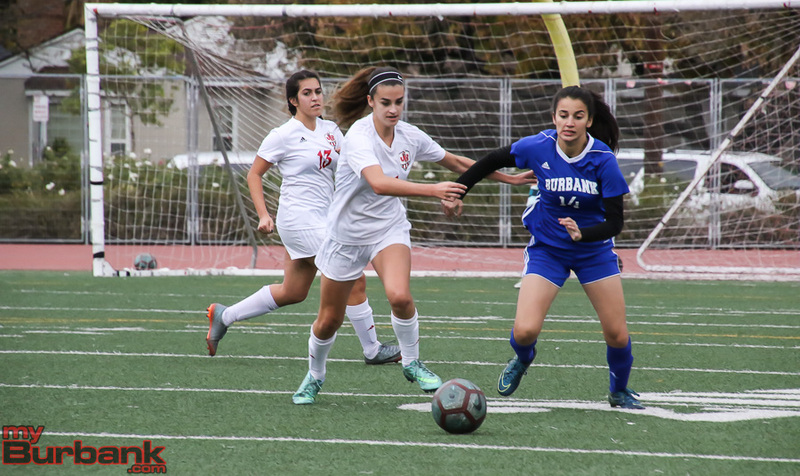 Burbank (1-8-2, 0-5-2) allowed just one more goal in the second half. 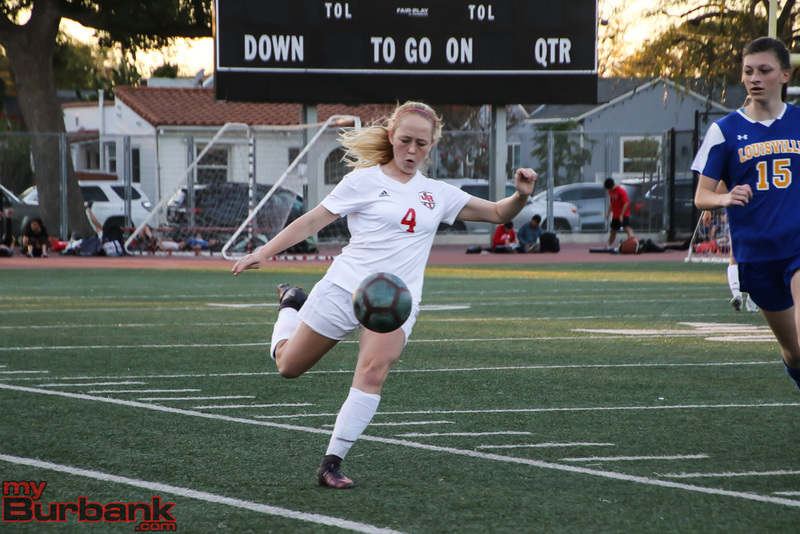 Burroughs scored its fourth goal in the 57th minute when Orla Giffen put back a loose ball from the edge of the goal box into the lower left corner. Tempers were clearly disrupting the flow of the game. 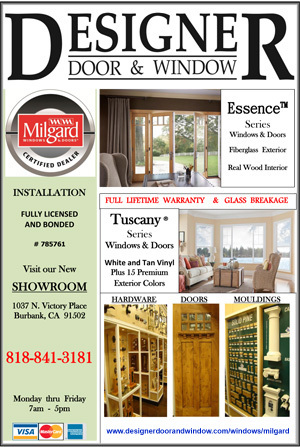 Brady Riggs said the fact that Burbank didn’t have a shot on goal was a factor in that. 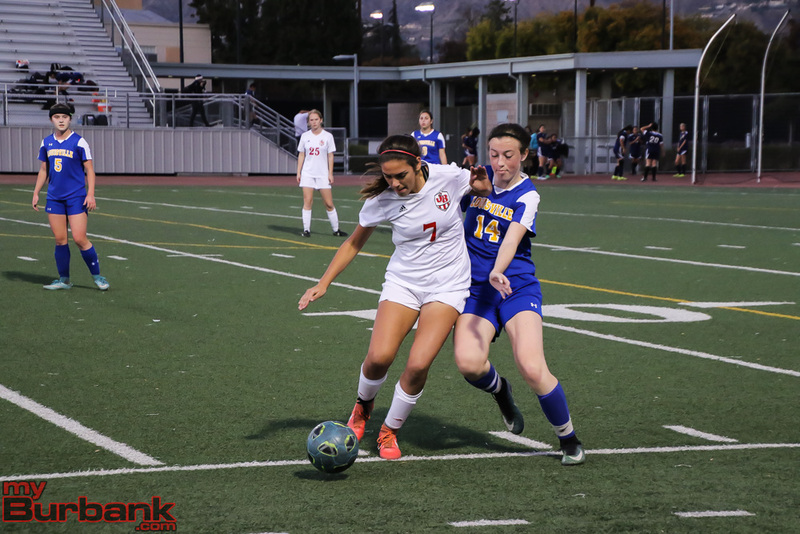 This entry was posted in Girls Soccer, Sports and tagged Abbie Riggs, Burbank girls soccer, Burroughs girls soccer, Catrina Villalpando, Lauryn Bailey, Orla Giffen, Trinity Vournas on January 20, 2018 by Jim Riggio. 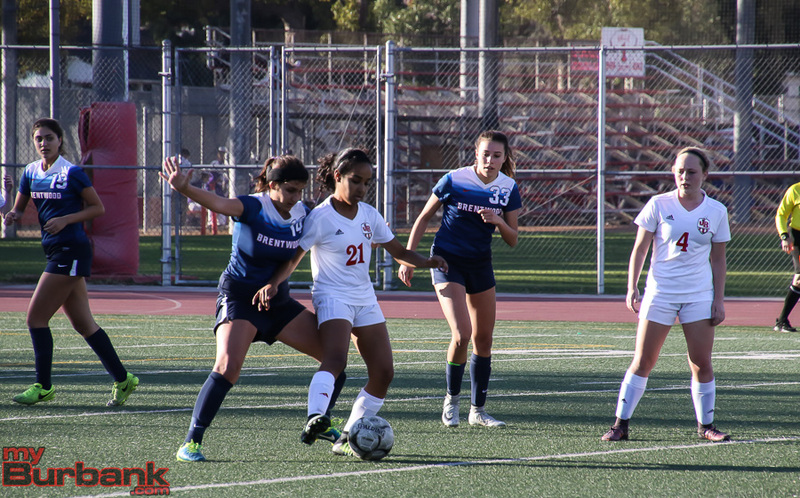 Perhaps it was fitting that the Burroughs High girls’ soccer team and Crescenta Valley, two hugely successful programs, ended up tied 2-2 during Friday’s Pacific League match at Memorial Field. 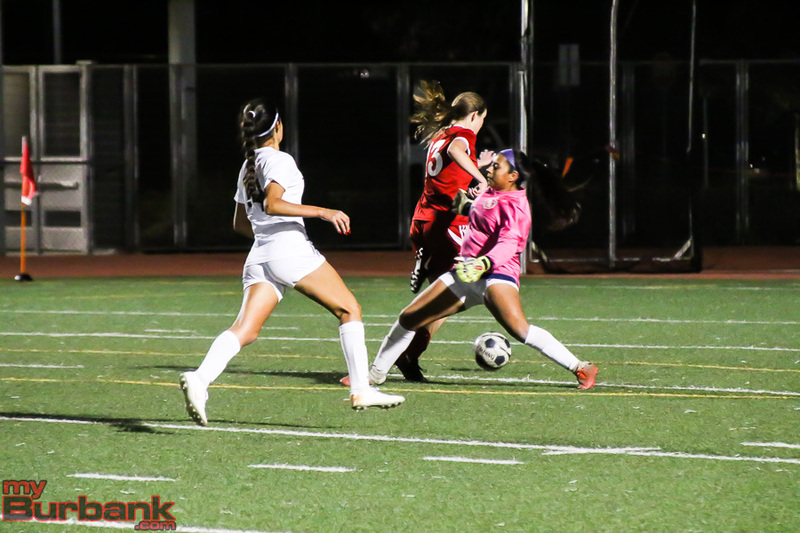 The Falcons had a pair of chances in the waning moments to pull out a win, but senior goalie Samantha Martinez stuffed out those threats. 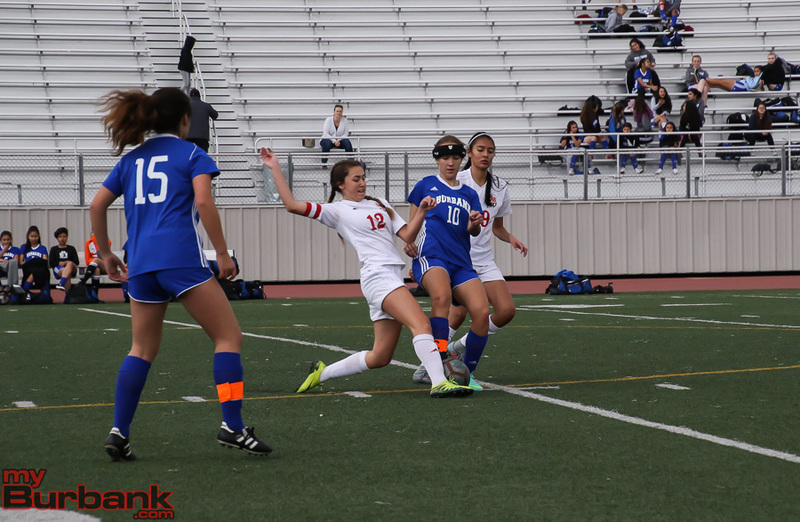 Sophomore Faith Sales had a blast from 10 yards in the 80th minute for the Falcons (5-5-4 and 4-0-1 in league) and sophomore Kathryn Thamasian’s rebound also didn’t find the net. These two powerhouses will meet on Feb. 2 at Crescenta Valley with a 3:15 p.m. start. Burroughs coach Brady Riggs expected a close match, but felt his team still should have won. Sophomore midfielder Olivia Cashman delivered the final kick, a 20-yarder in the extra time for the Indians. 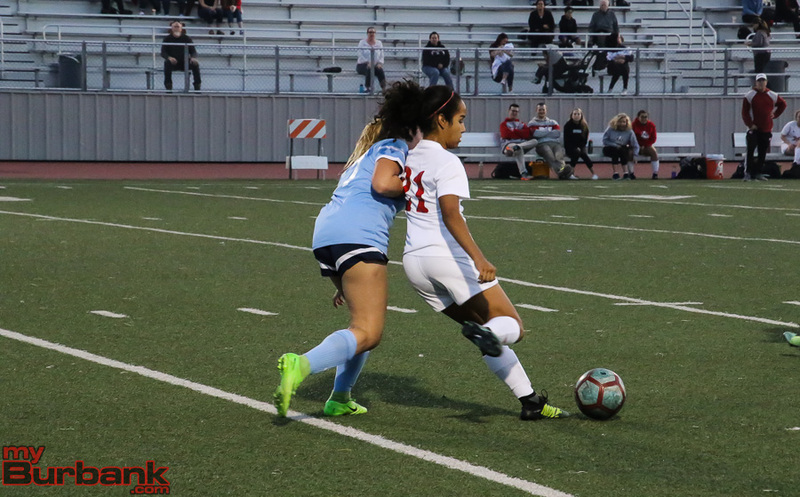 Crescenta Valley’s two goals came off the foot of freshman Chloe Ataya, including a 25-yarder from the right side in the fifth minute that settled into the left corner of the goal. 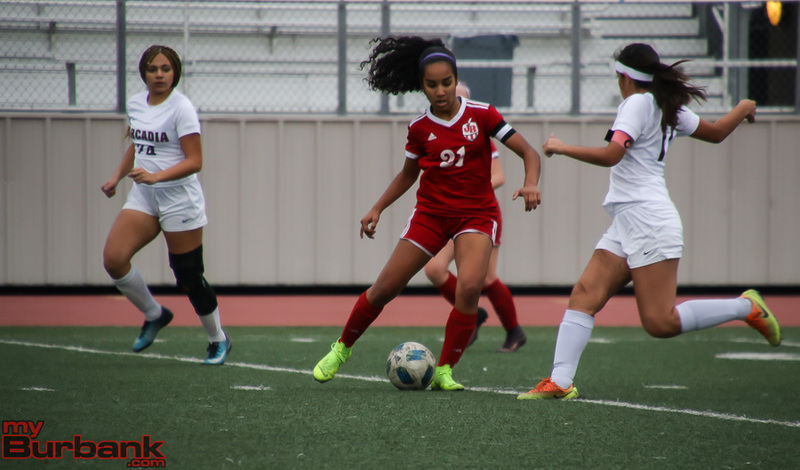 The Indians (9-2-2 and 4-0-1 in league) tied it at 1-1 in the 27th minute on freshman forward Lauryn Bailey’s 25-yarder. 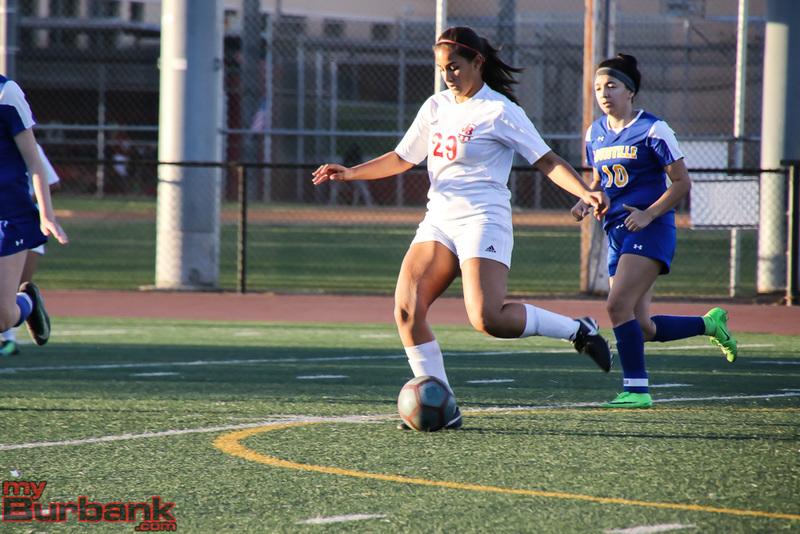 In the 44th minute, Burroughs pulled ahead 2-1 on junior forward Megan Rangel-Lynch’s five-yarder off a rebound. Crescenta Valley then leveled it at 2-2 on Ataya’s 15-yard penalty kick in the 50th minute. Ataya had a 15-yard tapper in the opening minute and a 25-yarder that sailed wide left in the third minute. In the seventh minute, Falcon freshman Ashlin Cuesta’s five-yarder failed to hit the mark. 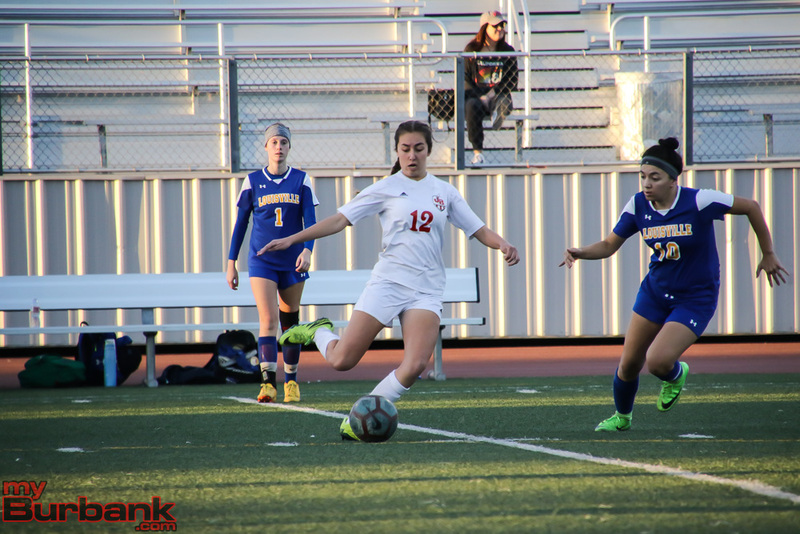 Senior midfielder Maddy Sena unloaded a 20-yarder in the ninth minute for the Indians, and was followed by Ataya’s 15-yard header in the 11th minute. 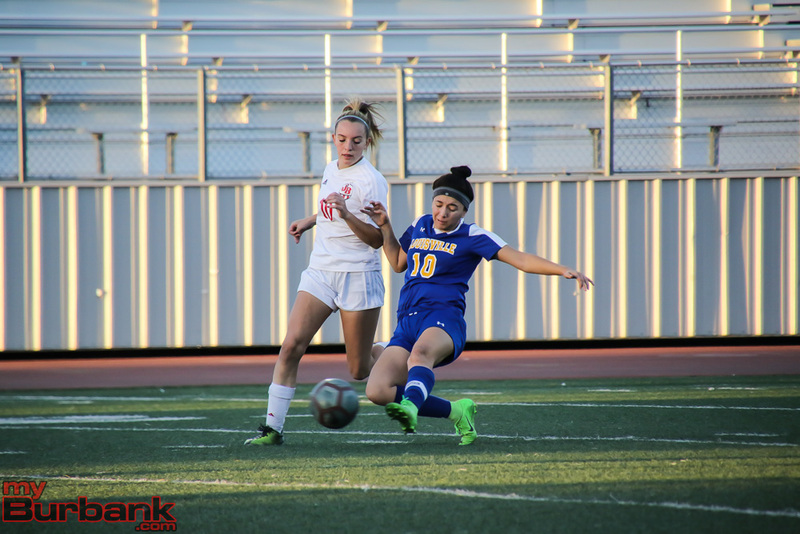 Burroughs junior midfielder Abbie Riggs walloped a 23-yard penalty kick that was blocked in the 15th minute. In the 18th minute, the Falcons’ Amy Rowe had a weak attempt from 25 yards. 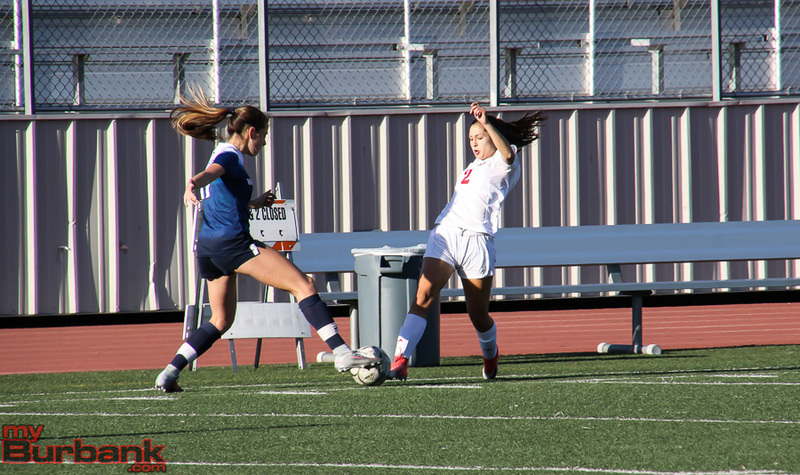 Two minutes later, Cuesta’s five-yarder failed to locate the net and one minute later senior Lindsay Sanfilippo’s 20-yarder also missed the target. Sophomore forward Trinity Vournas had a 20-yard boot in the 23rd minute for the Indians. 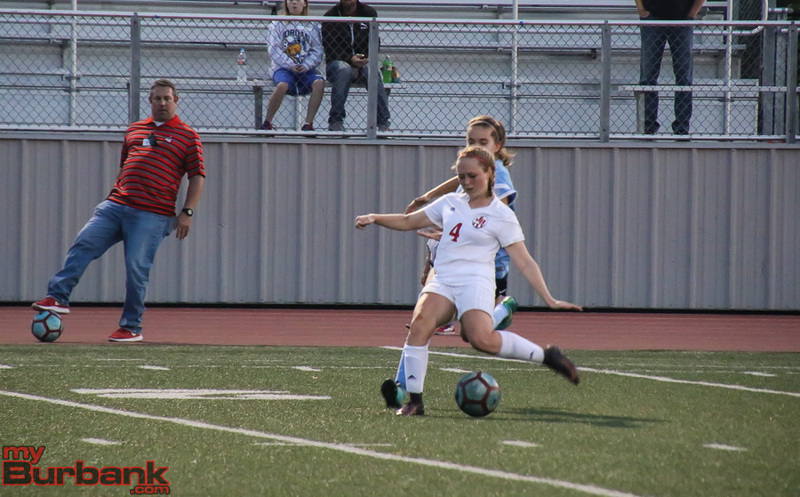 The Indians ended the first half with a Sena’s 25-yard kick drifting wide right in the 33rd minute and in the 39th minute, sophomore defender Orla Giffen’s 20-yard header also didn’t land in the net. Rowe’s 25-yard kick in the 43rd minute opened the second half, and after each team scored that evened it at 2-2, Sales had a corner kick in the 56th minute. 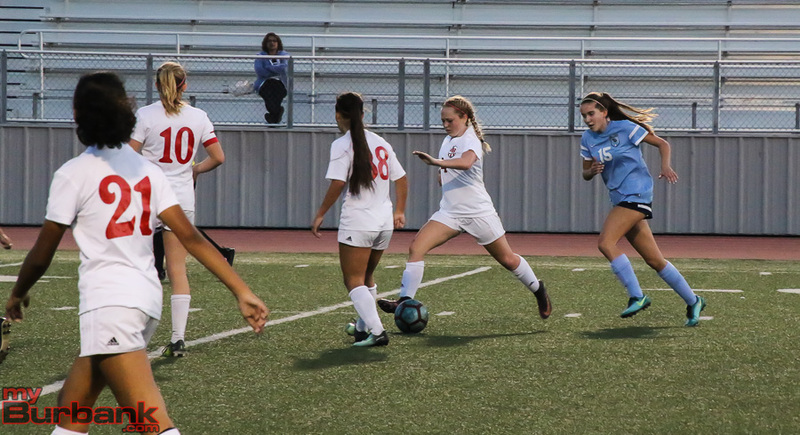 The Indians had the next eight shots that included senior forward Catrina Villalpando’s 25-yarder in the 57th minute, senior defender Anna Kasper’s four-yarder that scooted wide right in the 60th minute, Giffen’s follow-up in the same minute, senior defender Natalie Celio’s 10-yarder that hit the football crossbar in the 62nd minute, junior defender Emily McHorney’s 25-yarder that sailed wide right in the 64th mimnute, senior defender Carina Sierra’s 30-yarder in the 67th minute, Villalpando’s 15-yarder in the 71st minute and McHorney’s 35-yarder in the 76th minute. 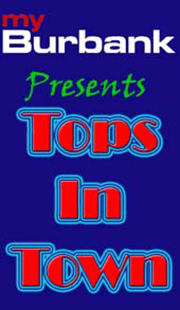 This entry was posted in Girls Soccer, Sports and tagged Anna Kasper, Burroughs High, Carina Sierra, Catrina Villalpando, Emily McHorney, Girls Soccer, Lauryn Bailey, Maddy Sena, Megan Rangel-Lynch, Natalie Celio, Olivia Cashman, Orla Giffen, Pacific League, Samantha Martinez, Trinity Vournas on January 13, 2018 by Rick Assad. 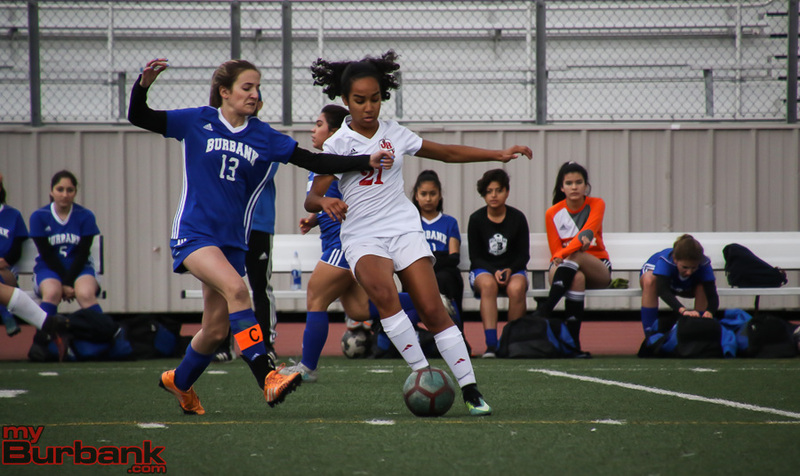 A sluggish beginning was shoved aside by the Burroughs High girls’ soccer team in its nonleague match against Louisville on Tuesday at Memorial Field. After falling behind by a goal, the Indians scored the next four including three in the second half over a span of 10 minutes that helped propel the Indians to a 4-1 victory over the Royals. 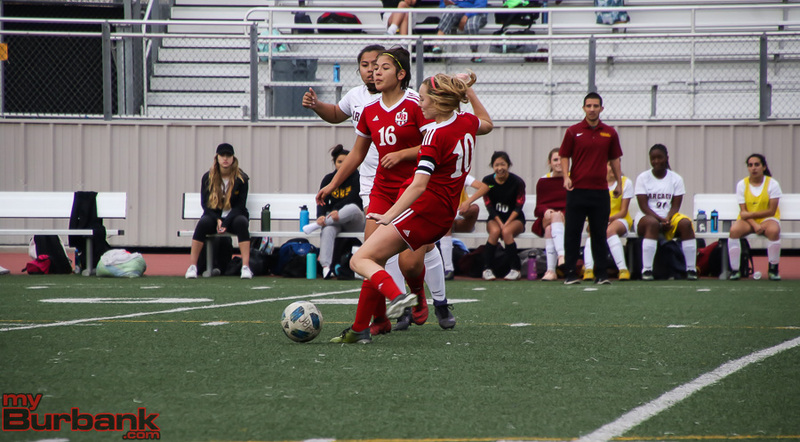 The scoring rampage began in the 63rd minute when senior forward Catrina Villalpando knocked in a 20-yard shot that made it 2-1. Eight minutes later, the lead swelled to 3-1 when senior defender Anna Kasper scored on a 35-yard free kick from the right sideline. The tally was a thing of beauty as Kasper’s kick left the ground and rose about 15 feet into the air and then curved into the lower portion of the net. In the 73rd minute, sophomore defender Orla Giffen found the back of the net on a 15-yard blast that made it 4-1. Brady said that the Royals are a quality team and will help the Indians prepare for the upcoming Pacific League portion of their schedule. 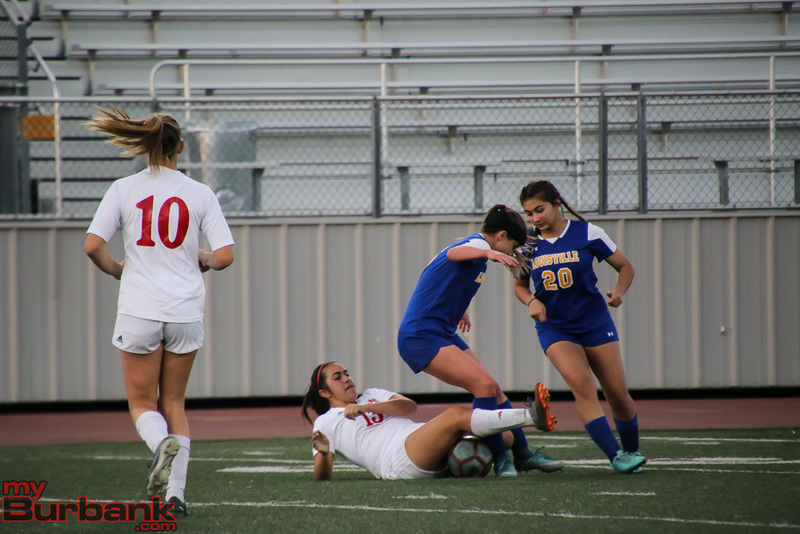 The Royals (2-2) took a 1-0 advantage on sophomore Olivia Wright’s 20-yard breakaway in the 26th minute against senior goalie Samantha Martinez, who had a shutout the rest of the game. The Indians tied it at 1-1 two minutes later when sophomore forward Trinity Vournas hammered in a 15-yarder. The Indians (4-1-1) dominated the early action of the first half after collecting three shots on goal. 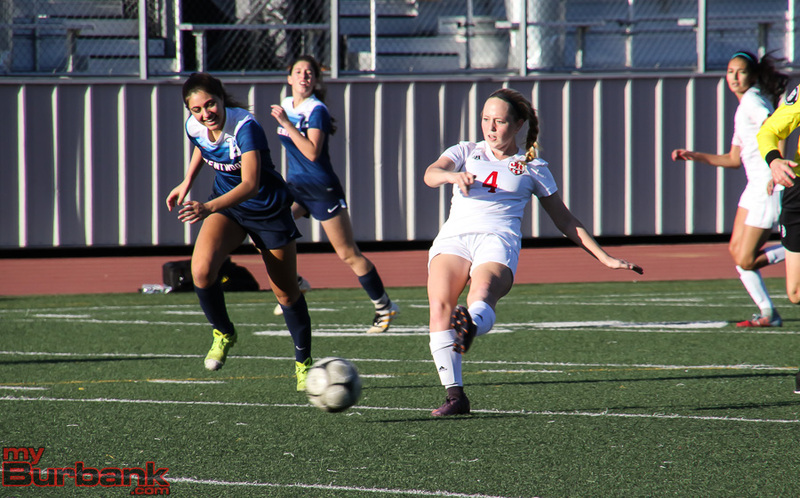 Sophomore defender Ava Kramer had a 10-yarder in the second minute followed by a 15-yarder from junior midfielder and captain Abbie Riggs in the third minute. A minute later, sophomore midfielder Olivia Cashman delivered a corner kick that hit the top bar of the net. 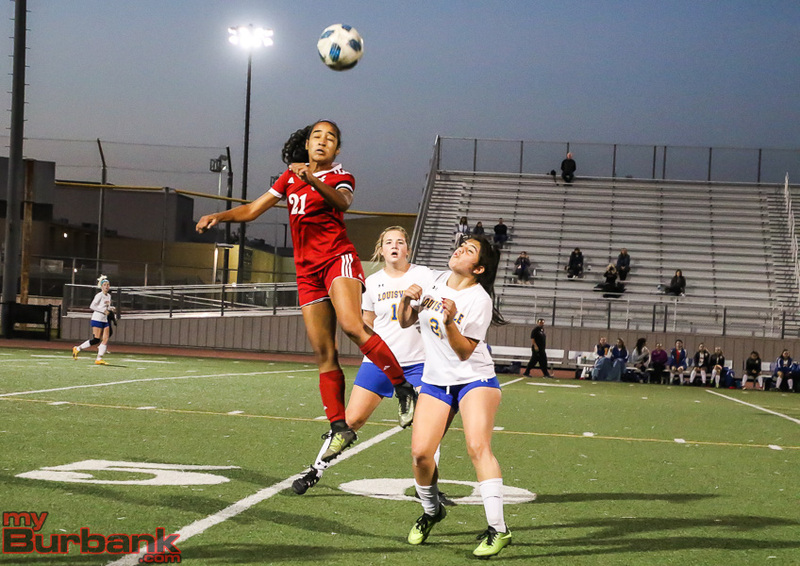 The Royals responded with a pair of shots that included Wright’s corner kick in the 11th minute and junior Keara Skeries’ 30-yard smash in the 13th minute. The next three shots belonged to the Indians as Cashman had a 20-yarder in the 14th minute, a 25-yarder in the 15th minute and Riggs’ 20-yarder in the 17th minute. Louisville sophomore Lila Dubois had a 15-yarder in the 19th minute, but senior midfielder and captain Maddy Sena delivered a 30-yarder in the 21st minute for the Indians. 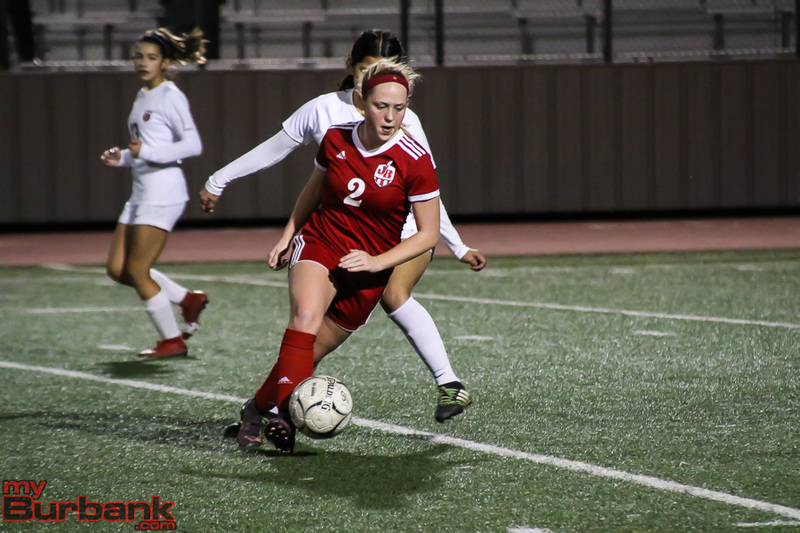 The Indians had the final four attempts of the half including Sena’s 30-yarder in the 27th minute, Kasper’s 15-yarder in the 32nd minute and junior forward Megan Rangel-Lynch’s five-yarder in the 36th minute. Burroughs, which outshot Louisville 11-4 in the opening half, outshot the Royals 13-4 in the second half that included three attempts from Riggs, who had a 20-yarder in the 46th minute, a 30-yarder that sailed wide right in the 57th minute and a 15-yarder in the 62nd minute. 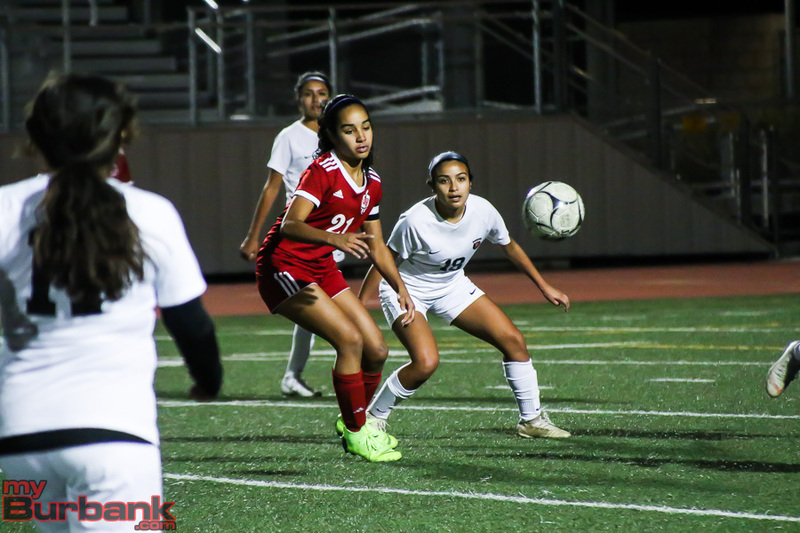 Villalpando, in addition to her tally, added a 20-yarder in front of the net in the 55th minute that was blocked by the goalie, while Cashman had a 35-yarder in the 58th minute that sailed wide right and a 30-yarder in the 61st minute. 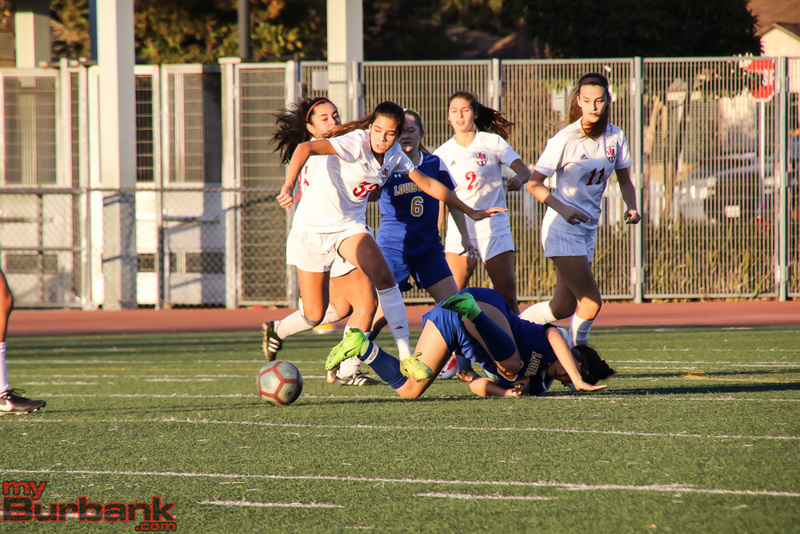 This entry was posted in Girls Soccer, Sports and tagged Abbie Riggs, Anna Kasper, Ava Kramer, Burroughs High, Catrina Villalpando, Girls Soccer, Maddy Sena, Megan Rangel-Lynch, Olivia Cashman, Orla Giffen, Samantha Martinez, Trinity Vournas on December 13, 2017 by Rick Assad.